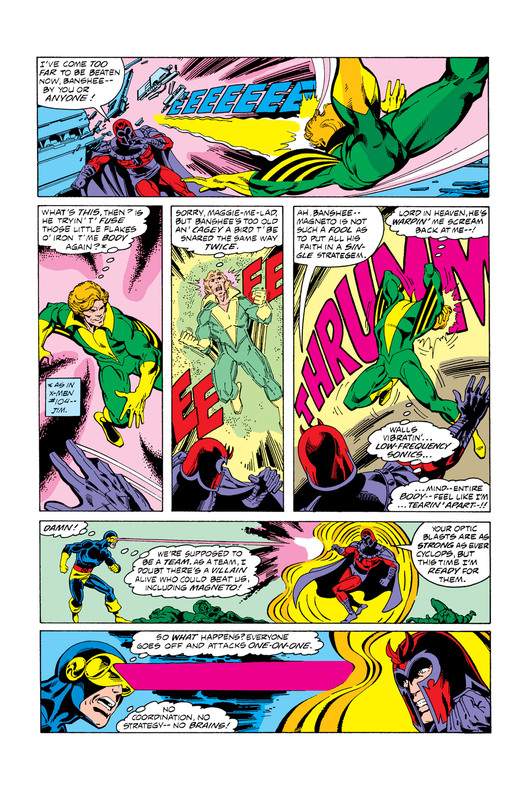 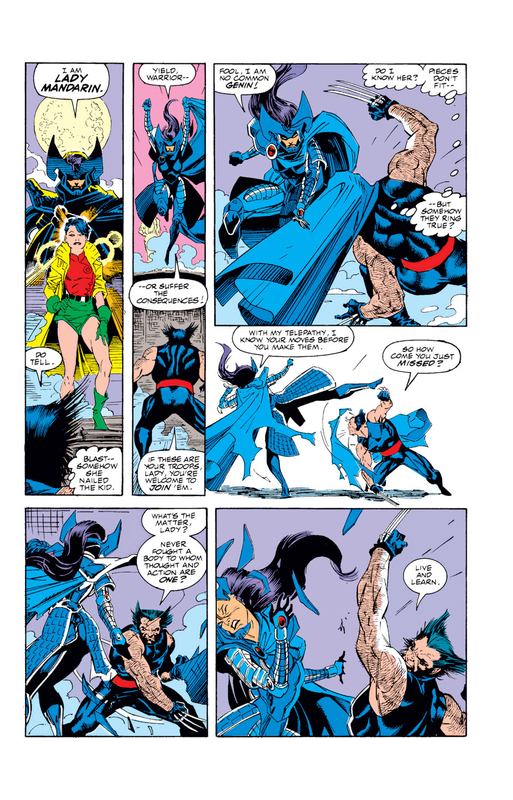 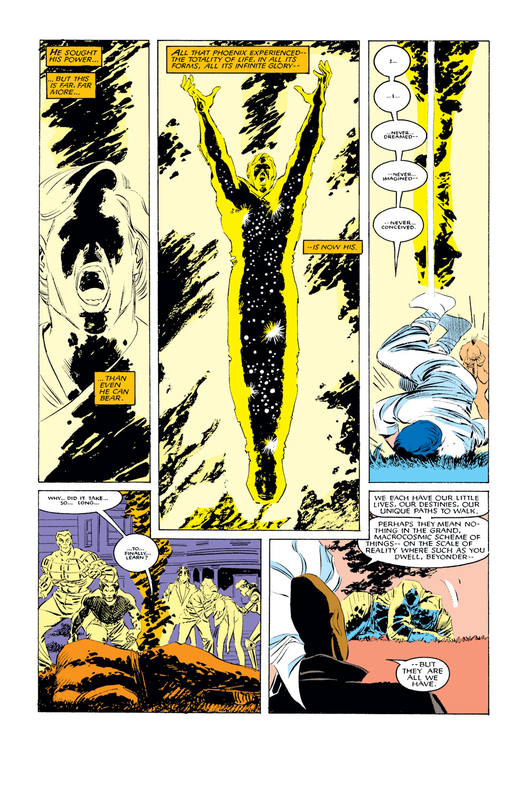 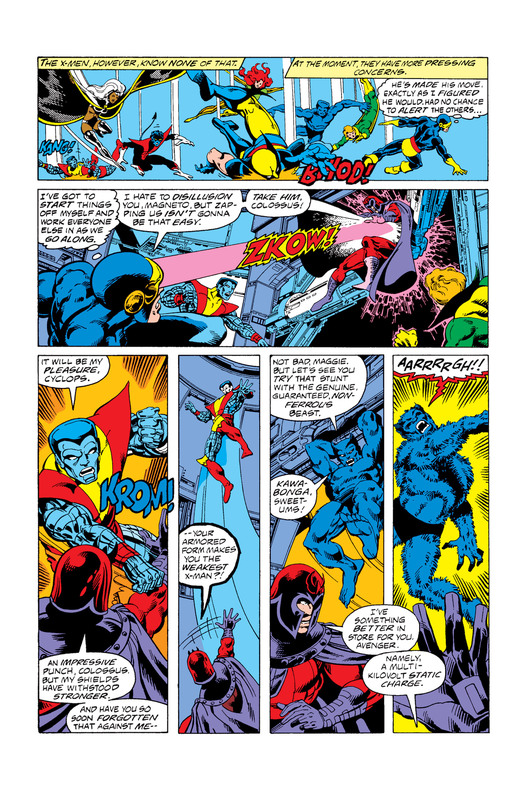 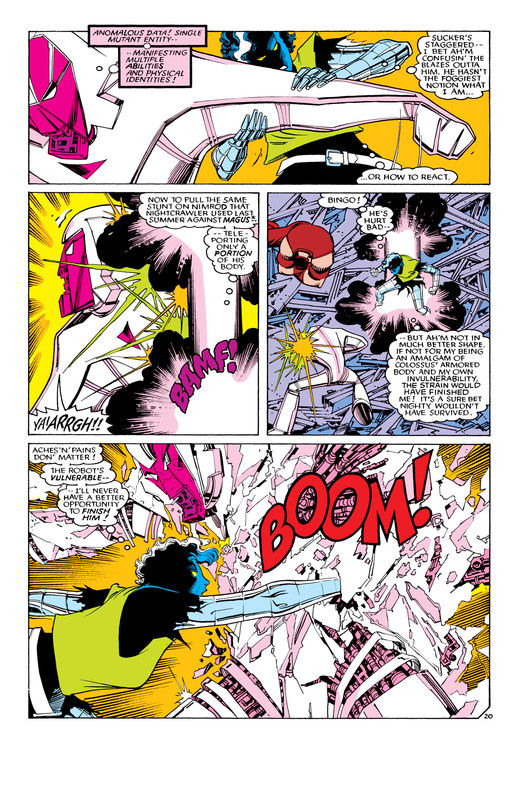 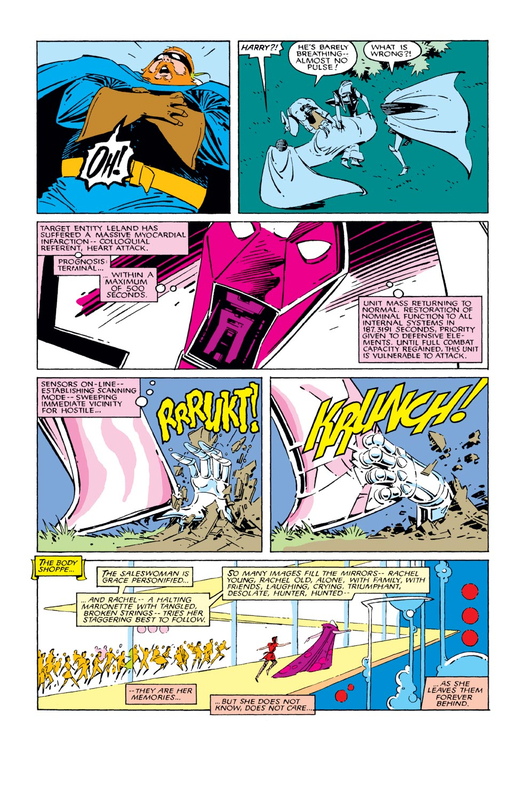 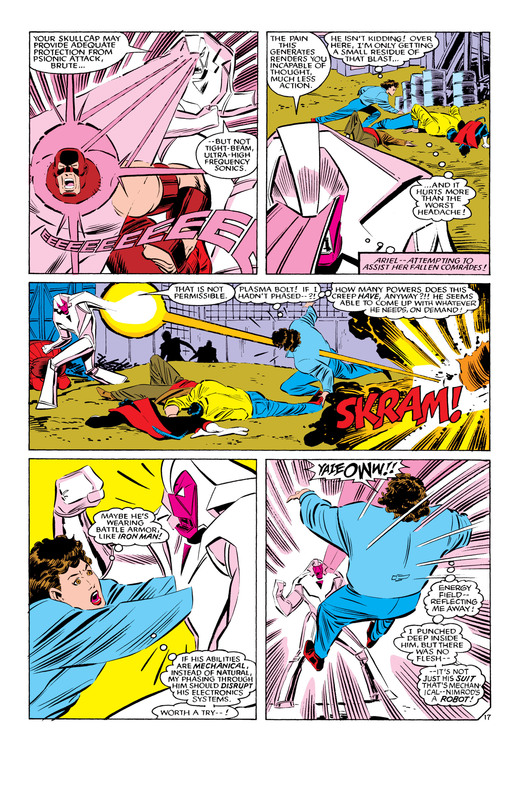 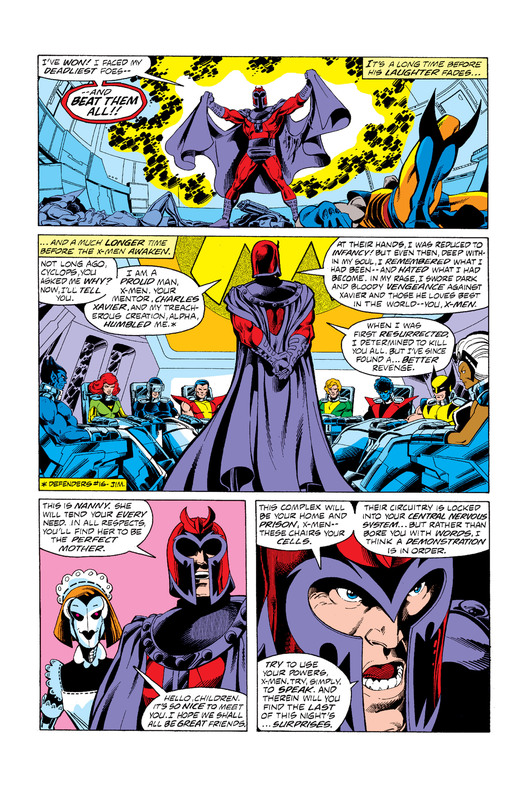 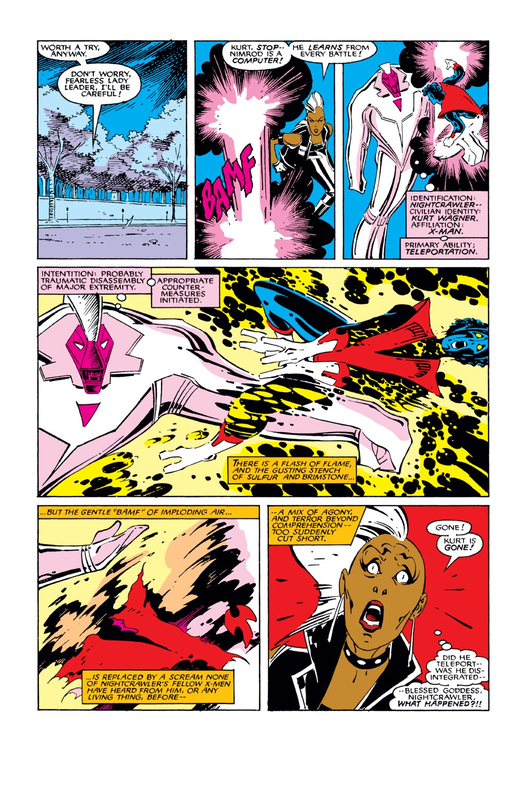 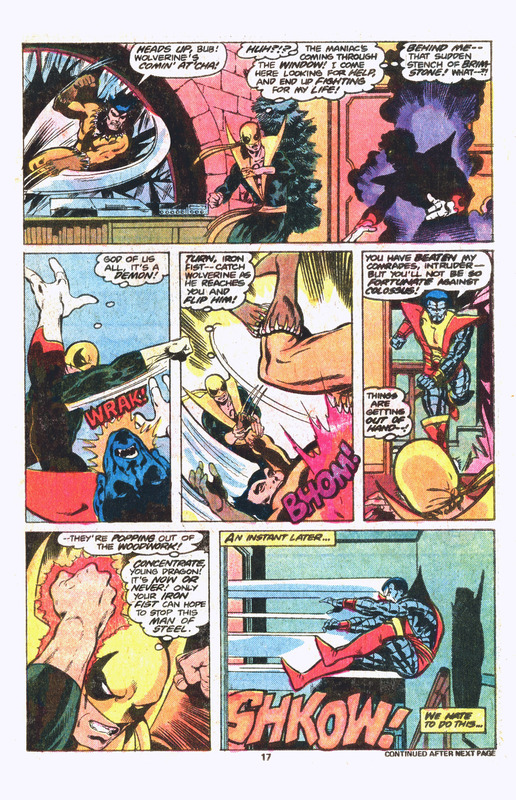 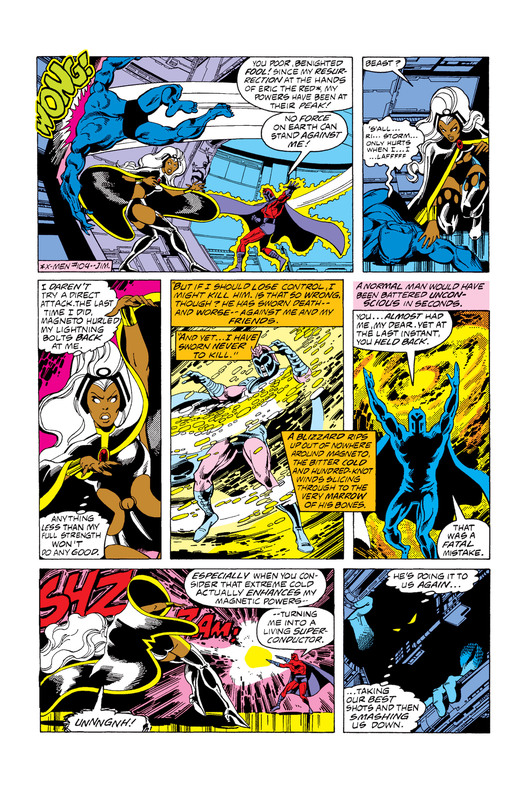 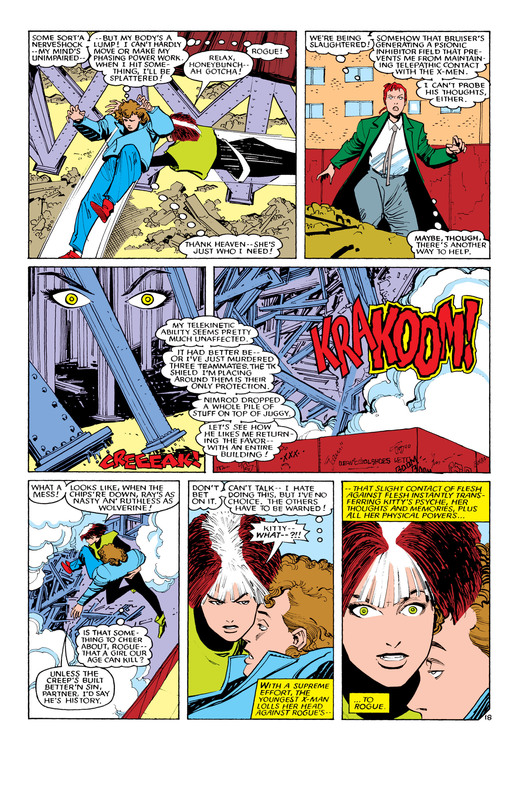 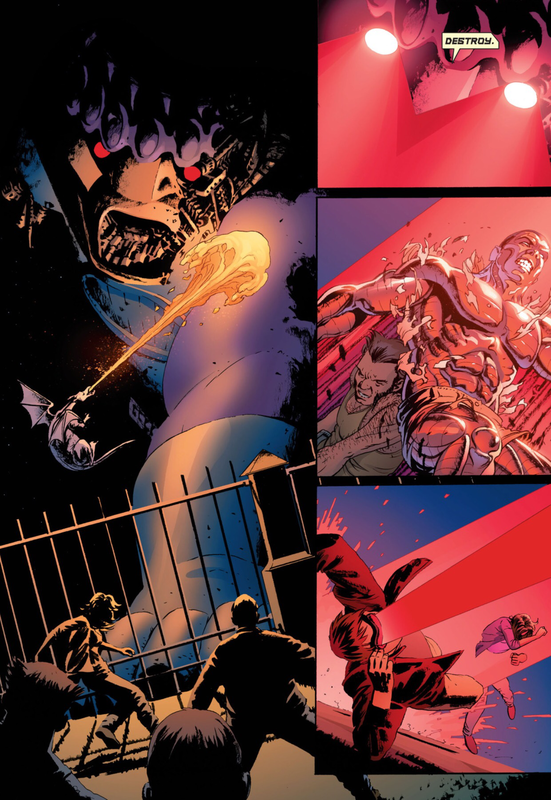 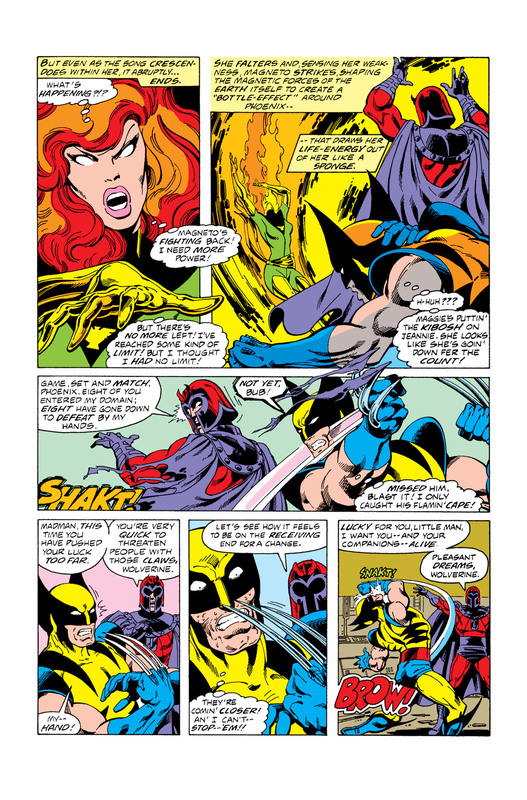 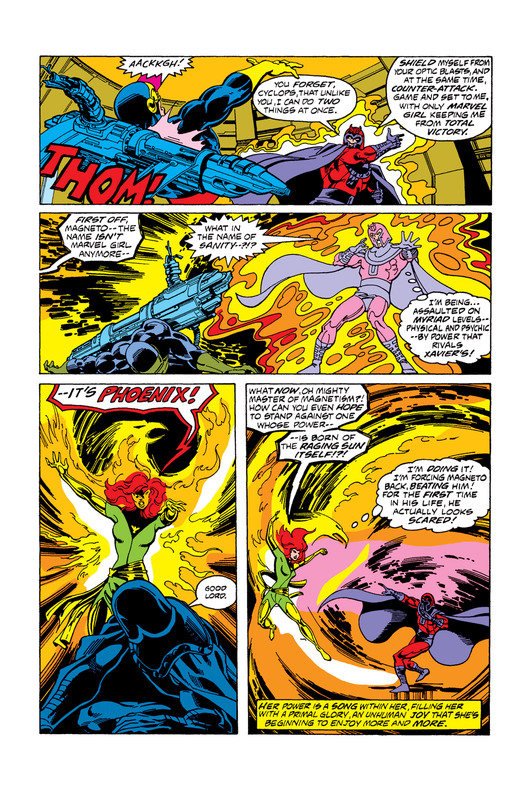 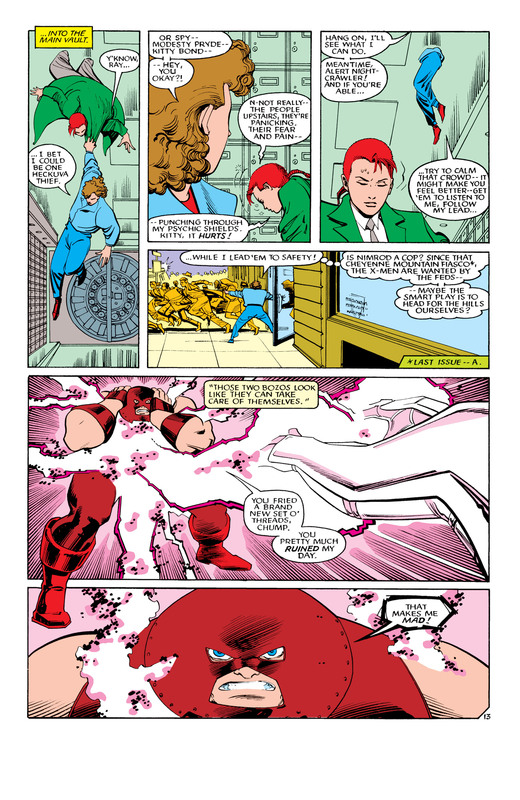 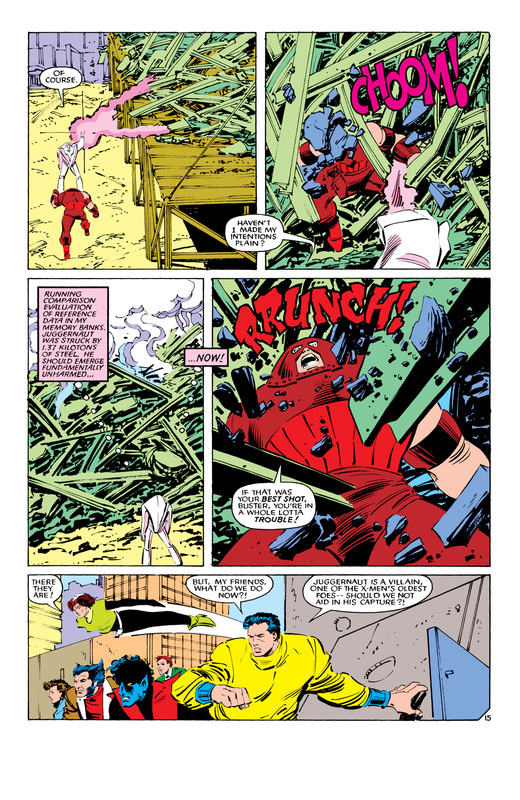 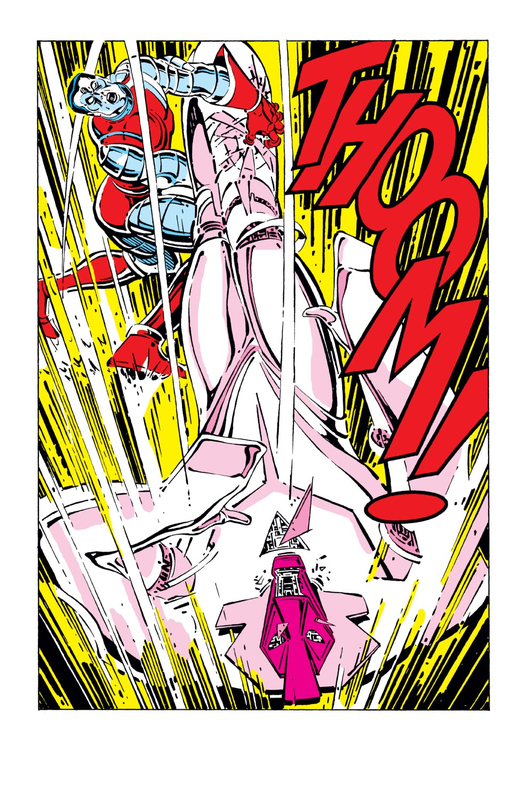 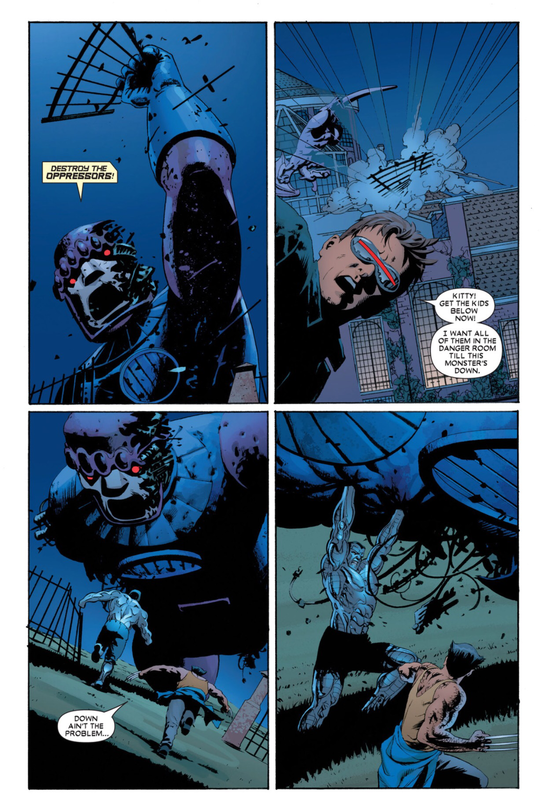 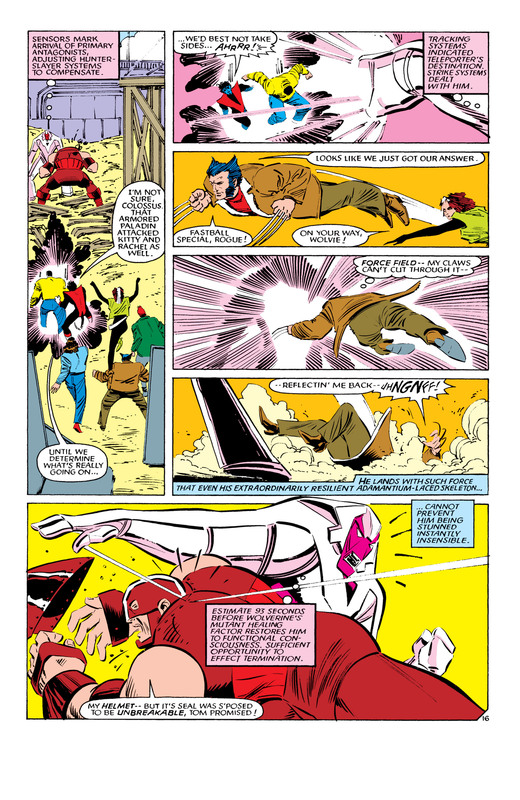 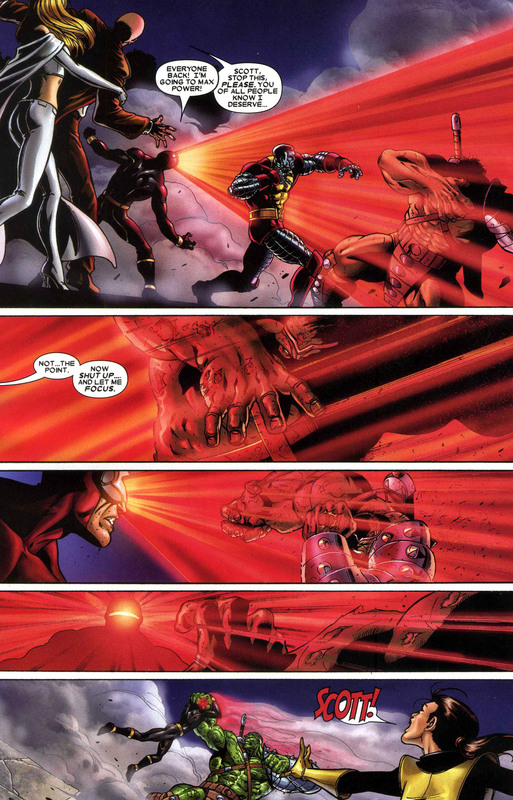 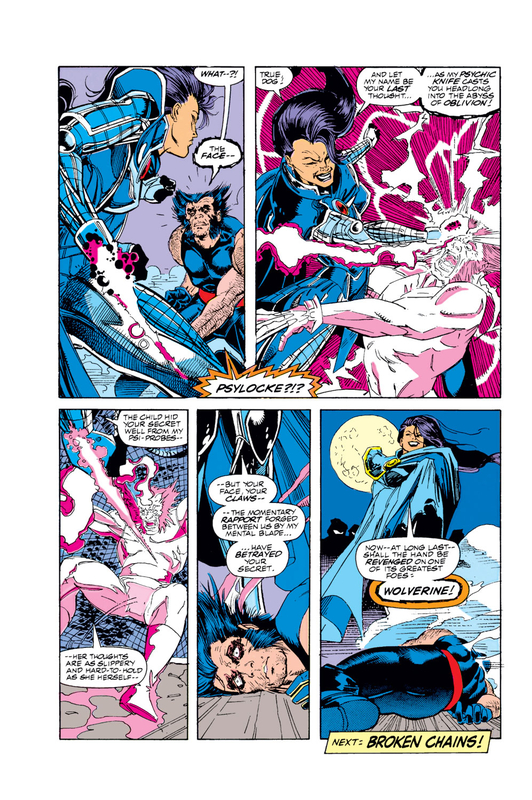 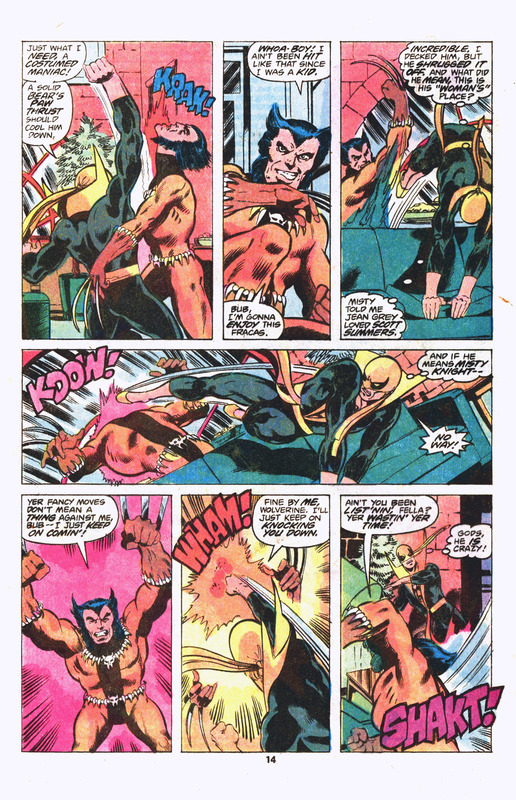 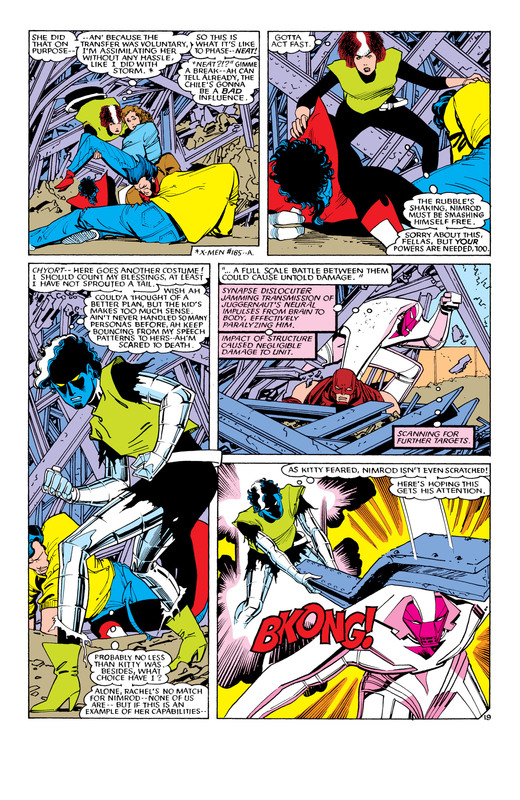 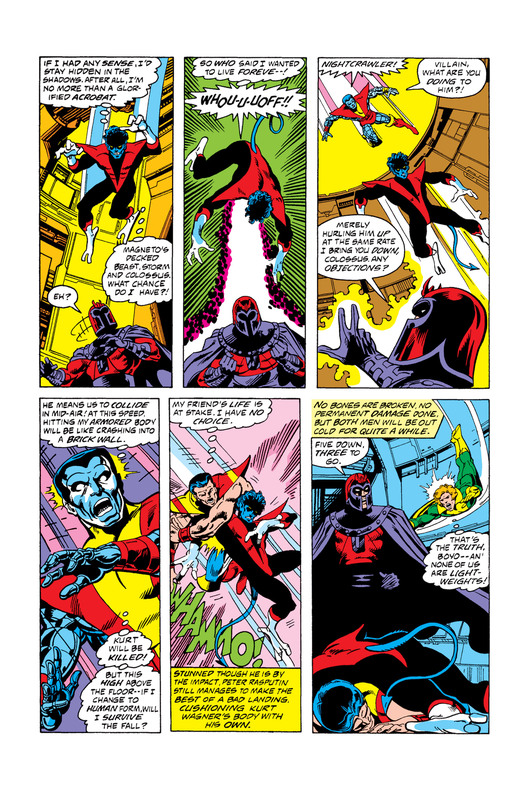 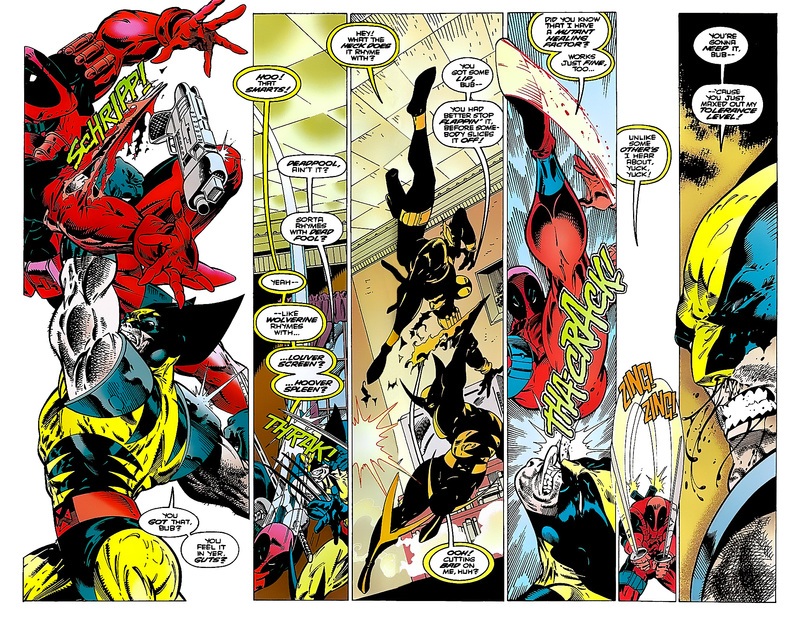 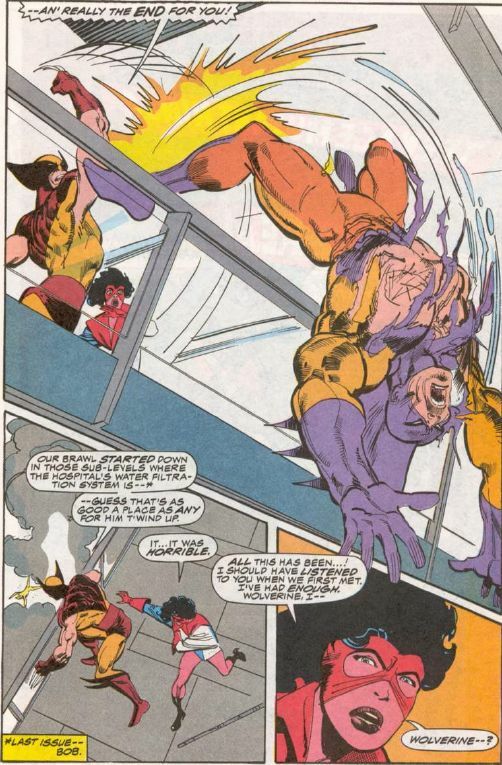 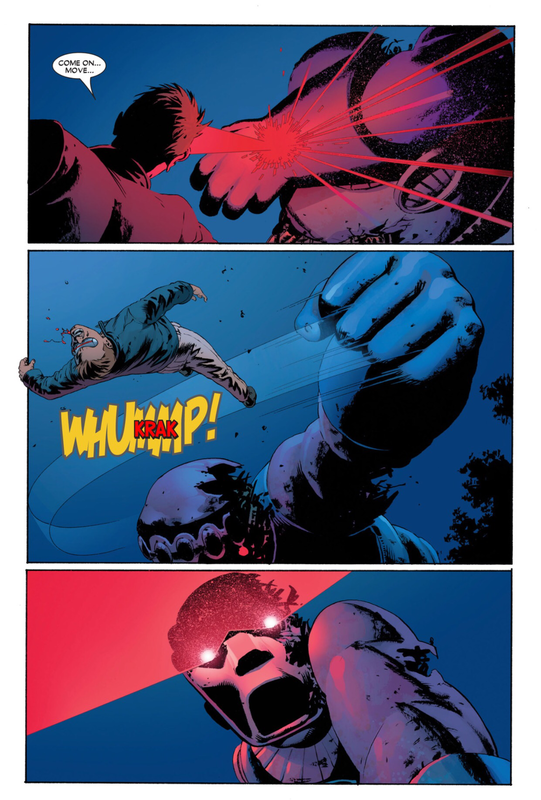 In X-Men #25 (1993), at the culmination of the “Fatal Attractions” crossover, the supervillain Magneto forcibly removes the adamantium from Wolverine’s skeleton. 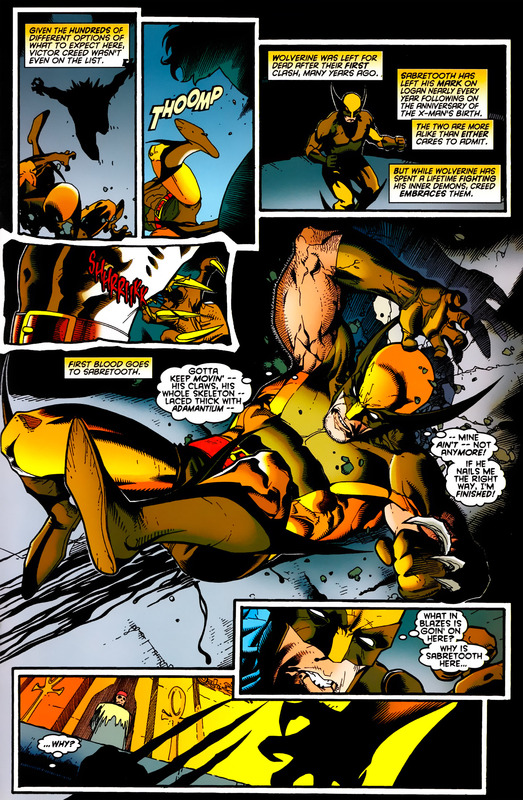 This massive trauma causes his healing factor to burn out and also leads to the discovery that his claws are actually bone. 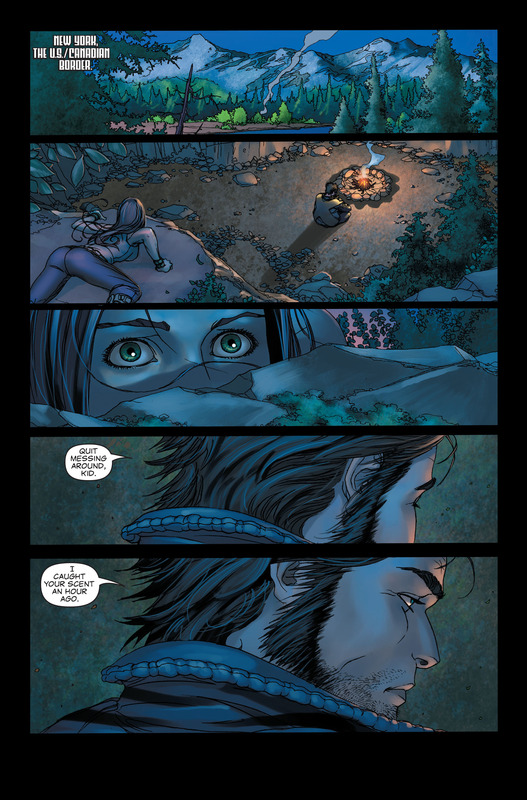 Wolverine leaves the X-Men for a time, embarking on a series of adventures during which his healing factor returns. 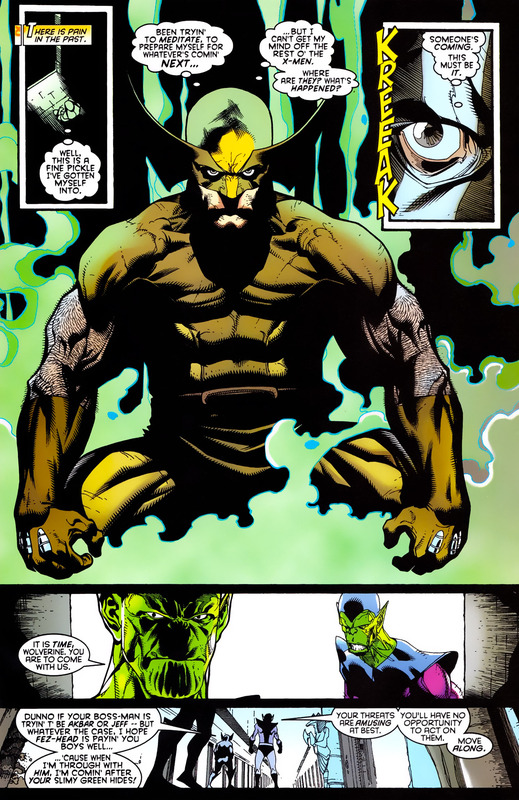 Feral by nature, Wolverine’s mutation process will eventually cause him to degenerate physically into a more primitive, bestial state. 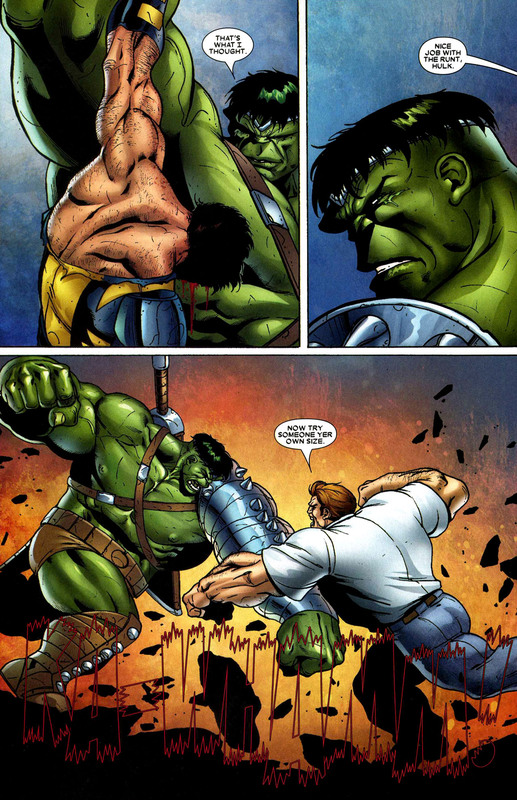 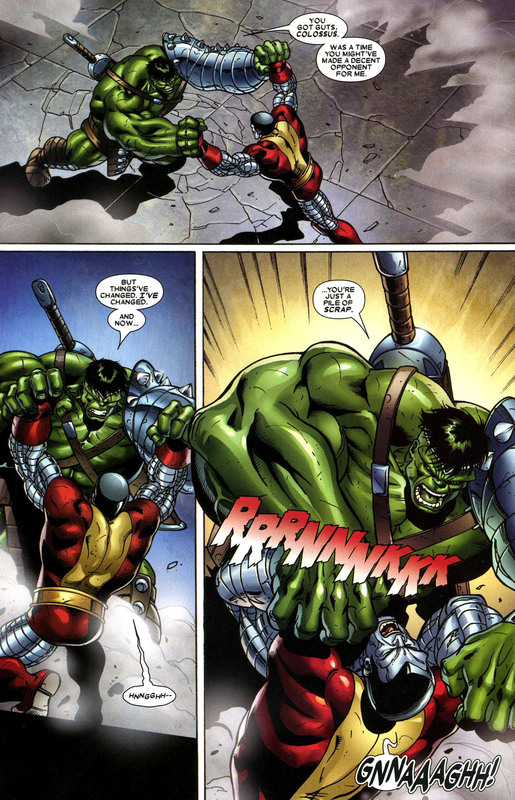 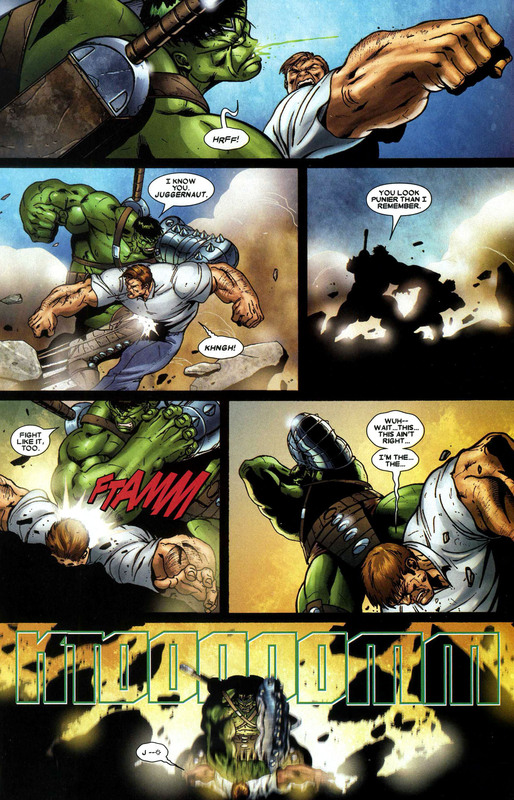 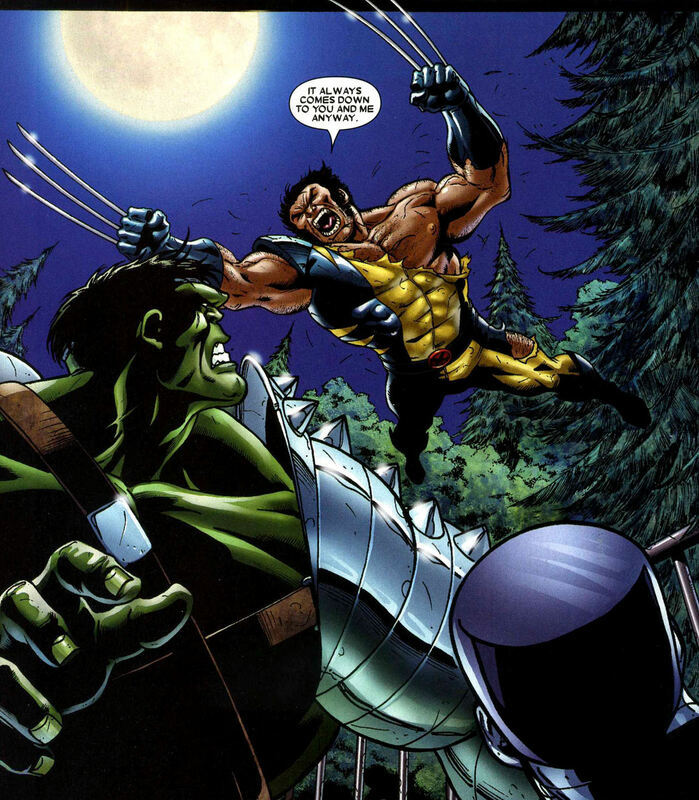 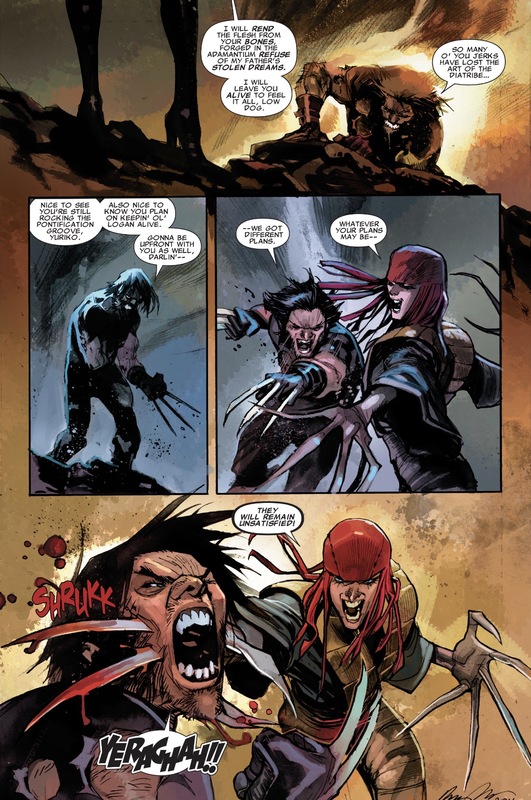 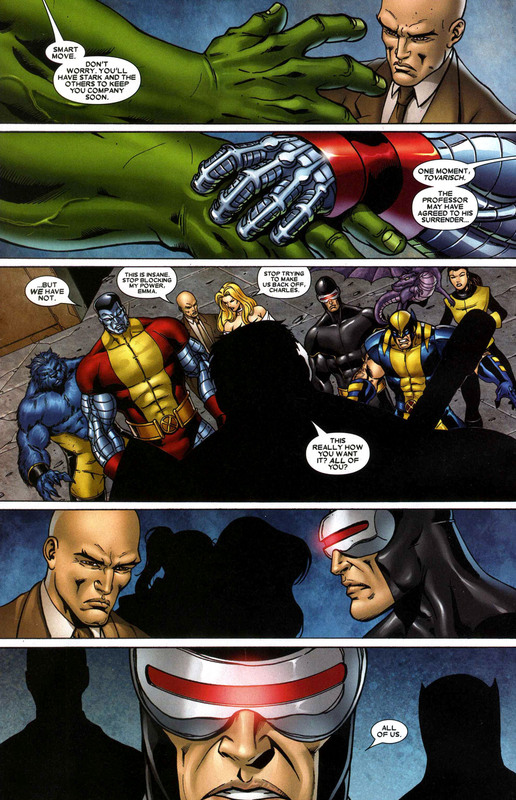 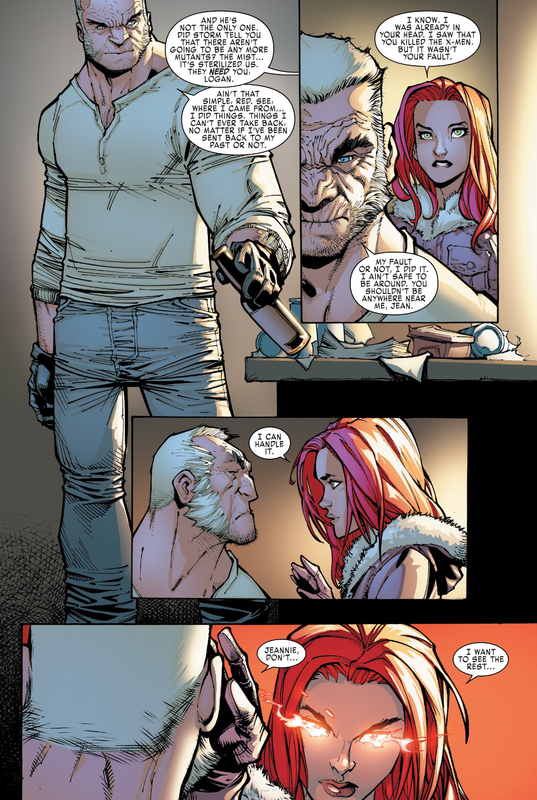 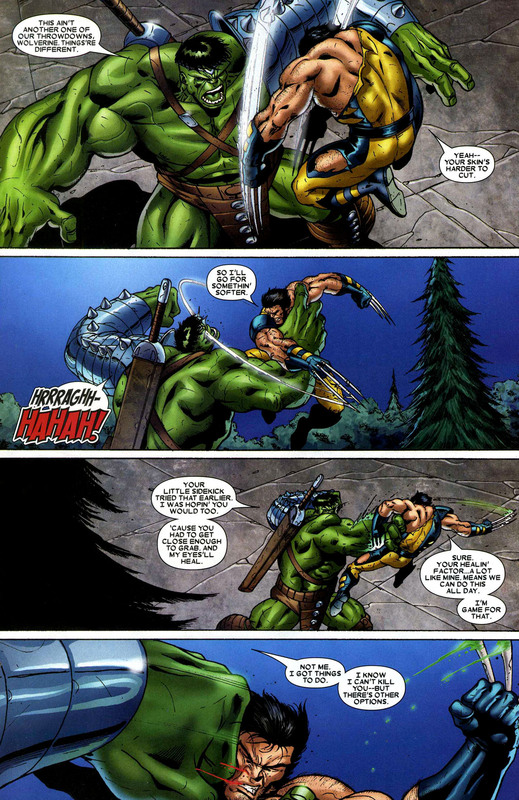 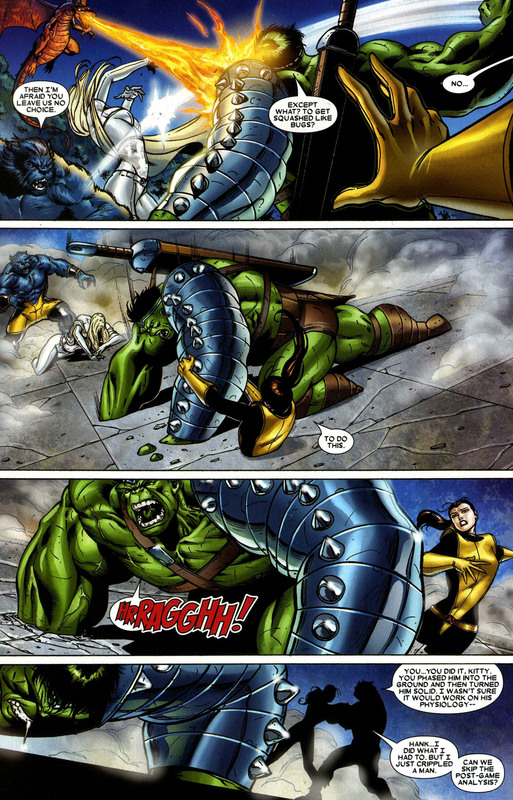 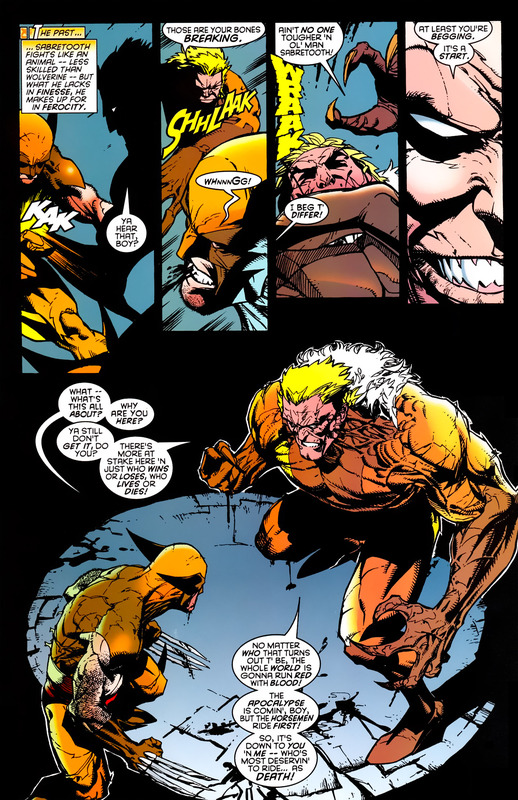 After his return to the X-Men, Cable’s son Genesis kidnaps Wolverine and attempts to re-bond adamantium to his skeleton. 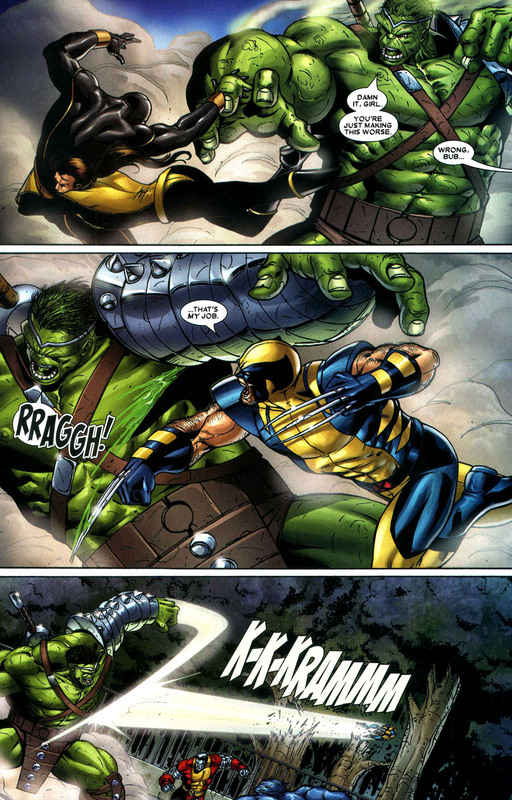 This is unsuccessful and causes Wolverine’s mutation to accelerate out of control. 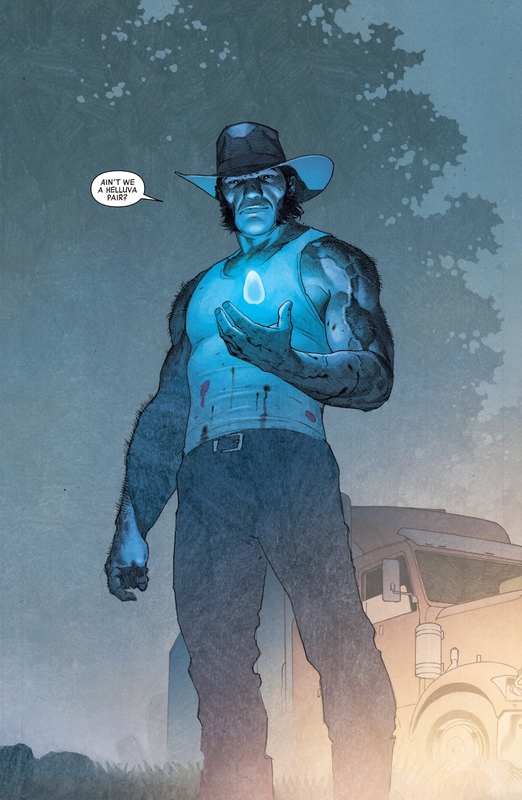 He is temporarily changed into a semi-sentient beast-like form. 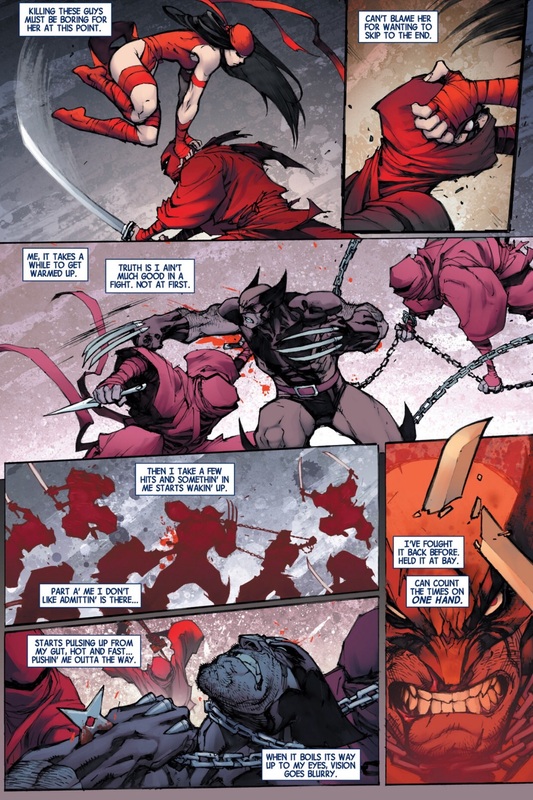 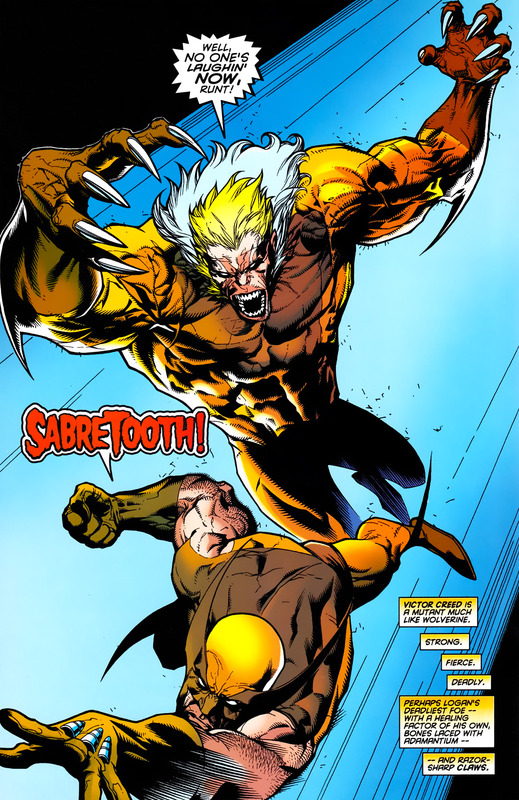 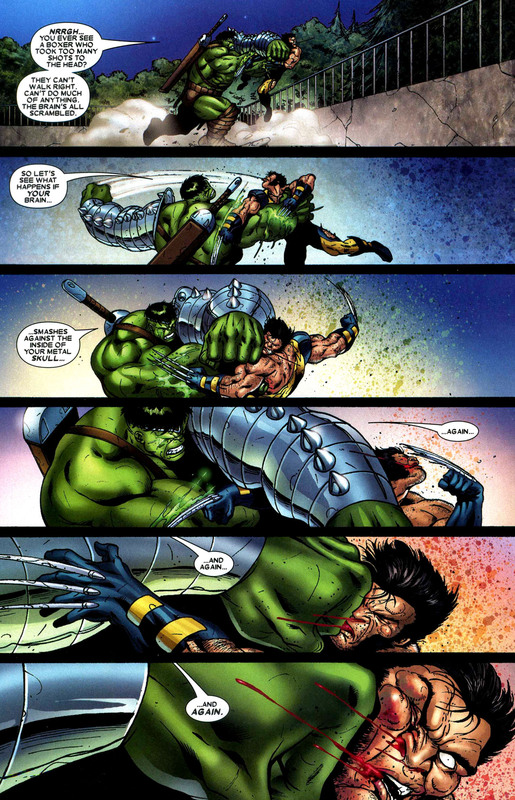 Eventually, the villain Apocalypse captures Wolverine, brainwashes him into becoming the Horseman Death and after this battle with Sabertooth to determine who is worthy of the metal, successfully re-bonds adamantium to his skeleton. 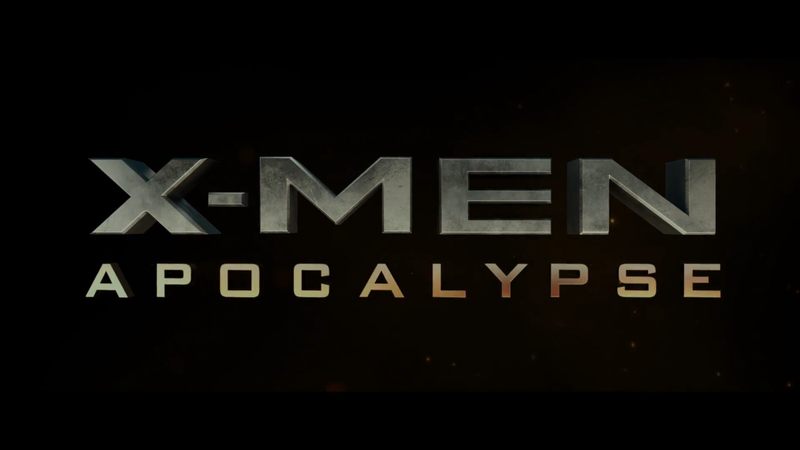 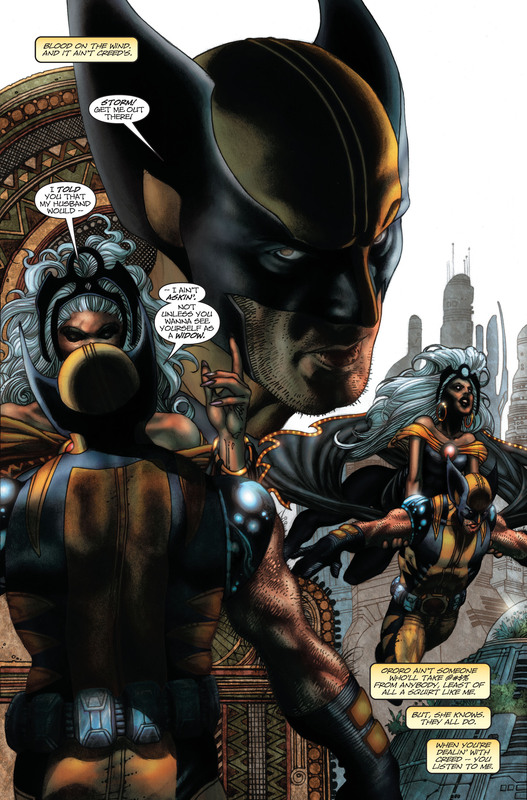 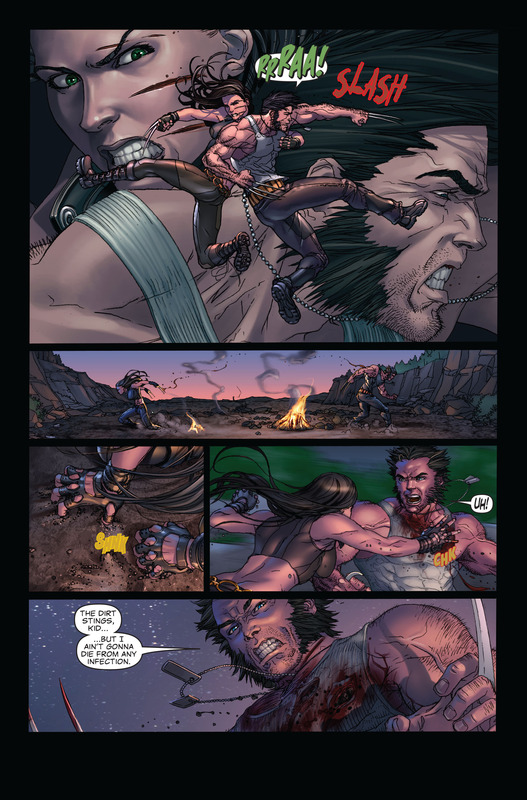 Wolverine overcomes Apocalypse’s programming and returns to the X-Men. 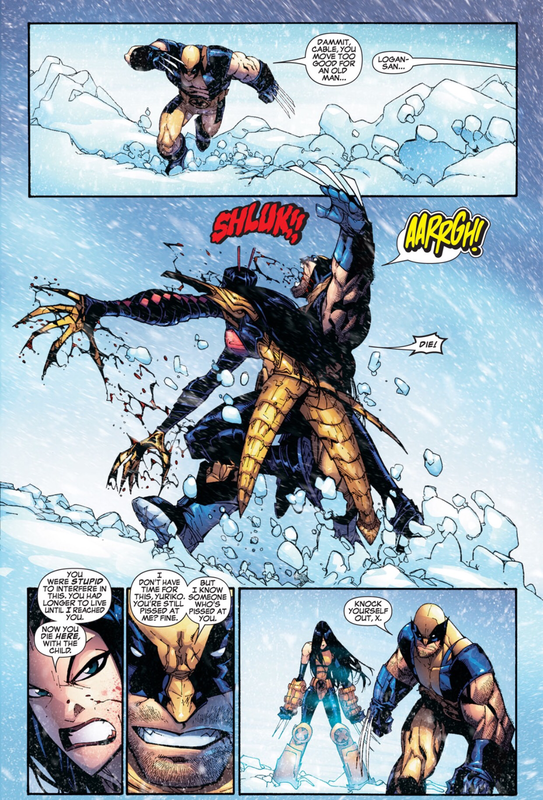 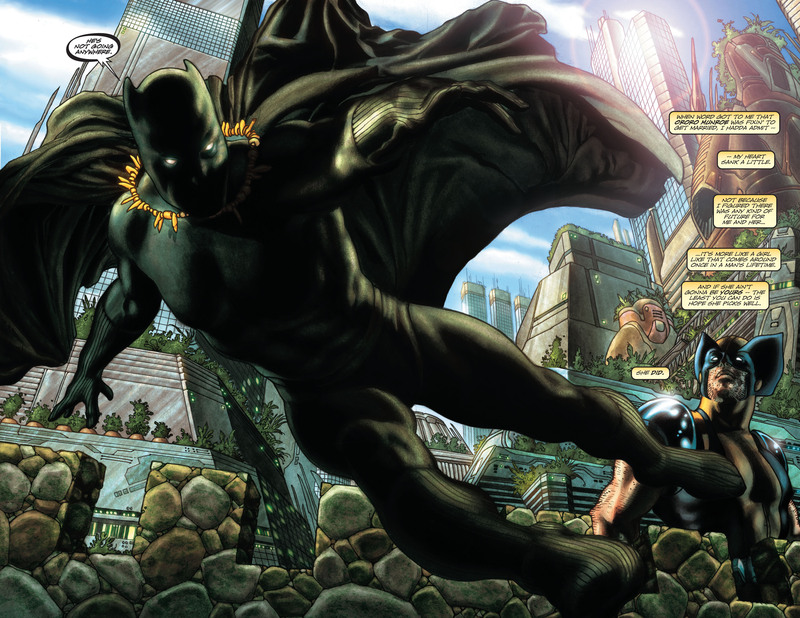 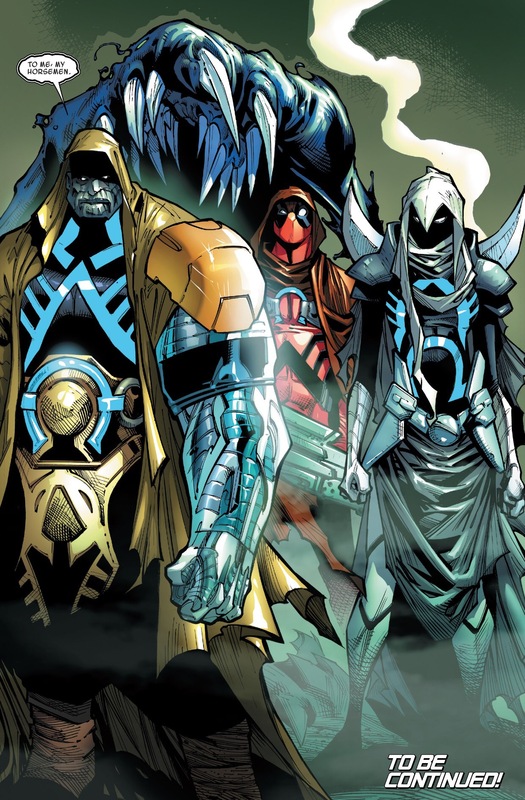 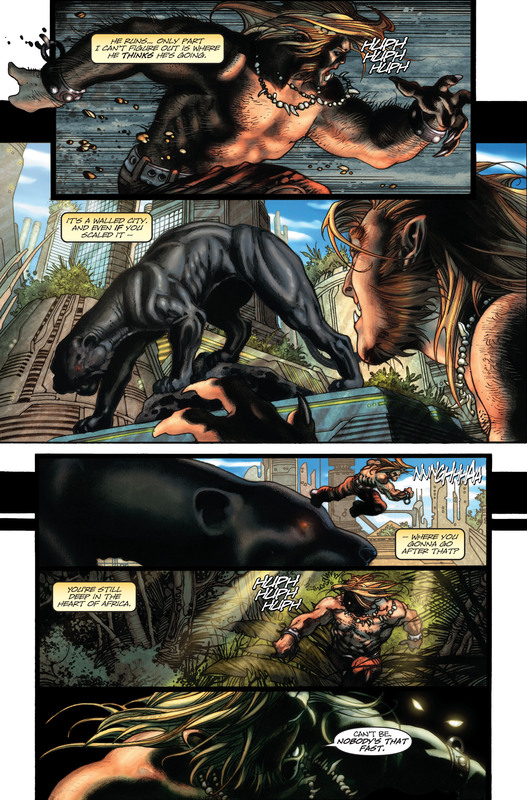 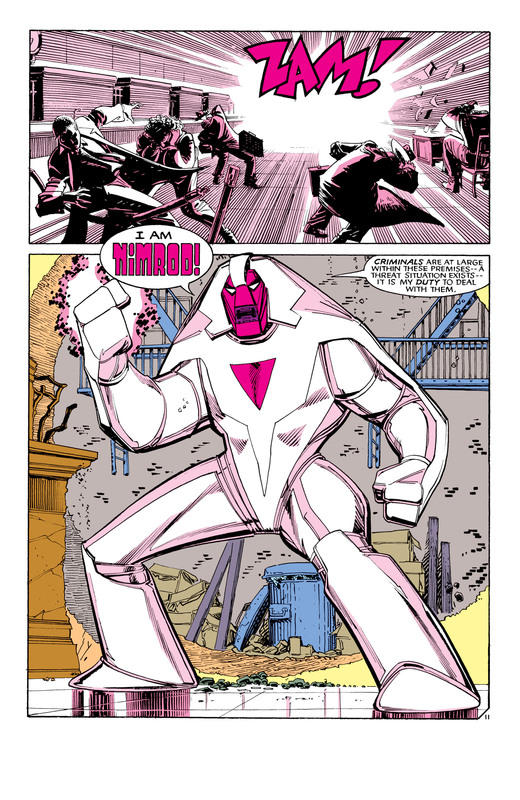 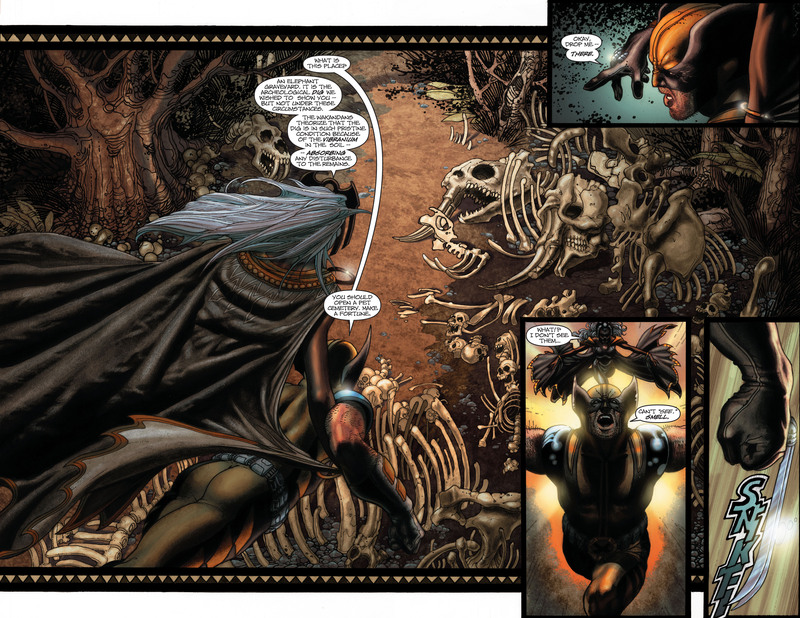 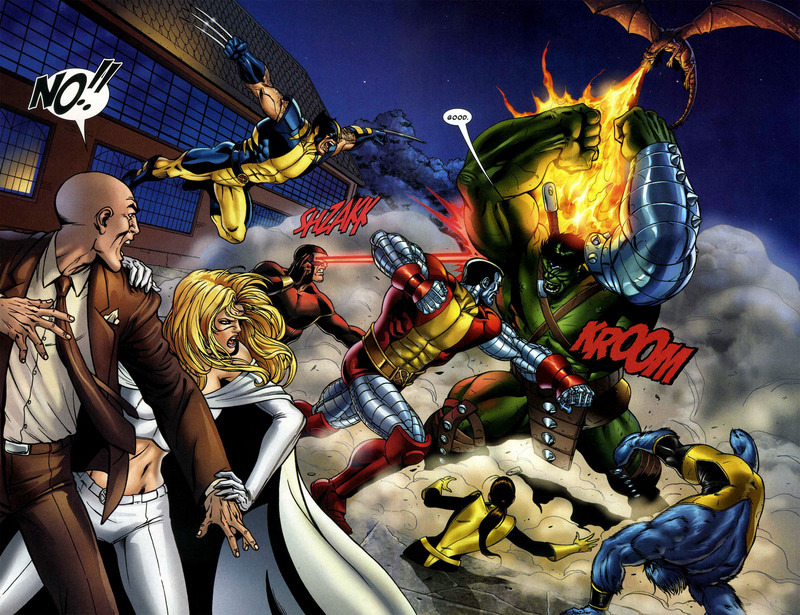 This entry was posted in Marvel Comics, Versus, Wolverine and tagged adamantium, apocalypse, sabertooth on February 2, 2016 by lowbrowcomics. 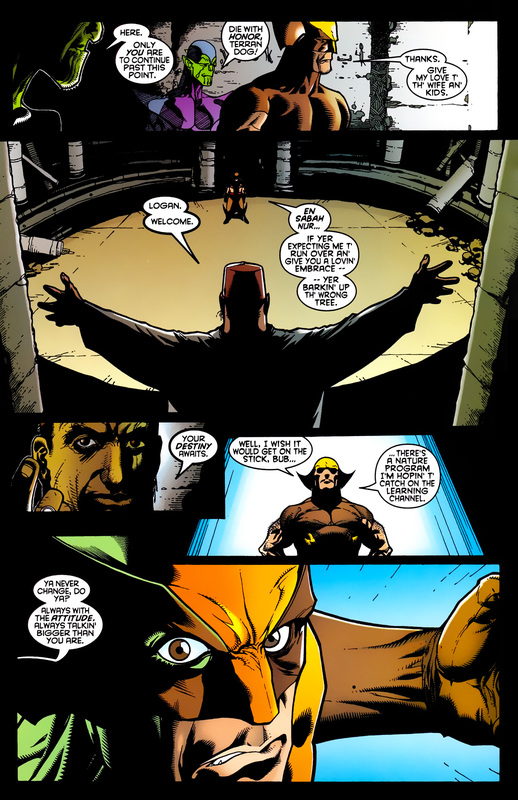 Marvel Comics Presents: Weapon X is the chronicle of Wolverine’s days with the Weapon X project, from the bonding of adamantium to his bones to his escape from the project, were revealed in the “Weapon X” story arc, written and illustrated by Barry Windsor-Smith and published in installments in the anthology series Marvel Comics Presents in 1991. 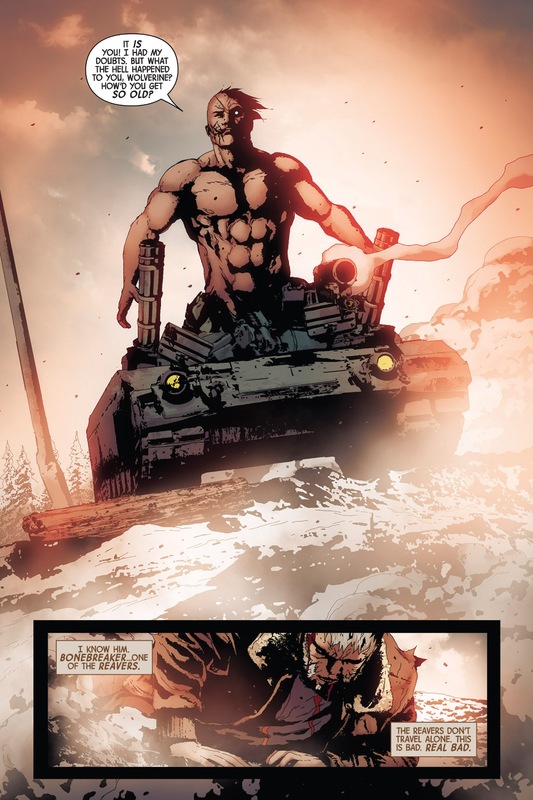 Weapon X is a fictional clandestine government genetic research facility project appearing in American comic books published by Marvel Comics. 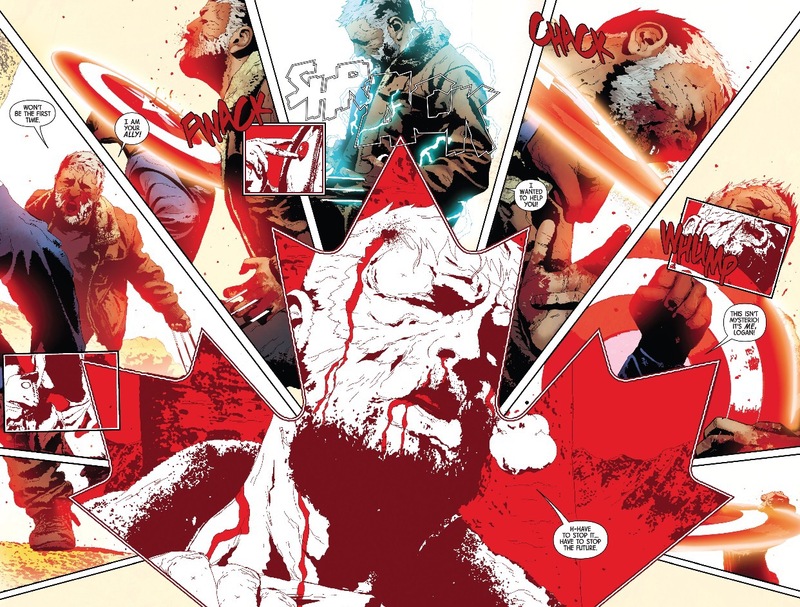 They are conducted by the Canadian Government’s Department K, which turns willing and unwilling beings into living weapons. 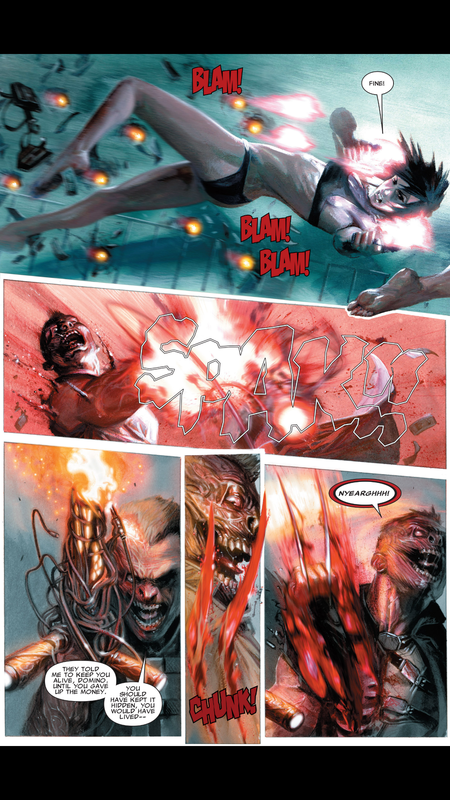 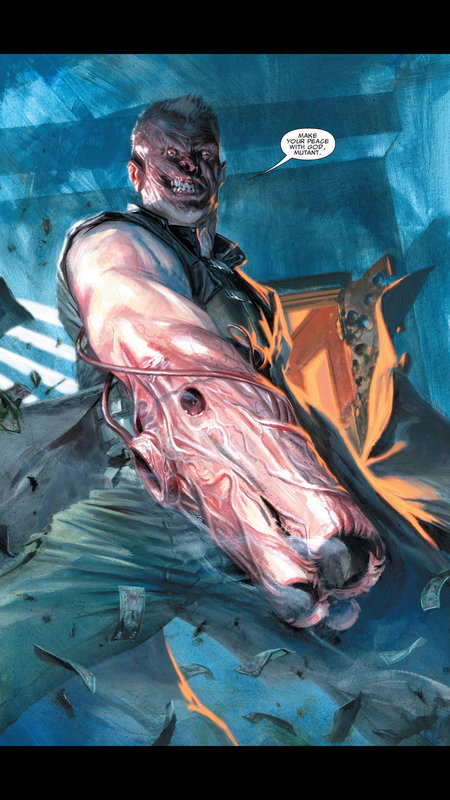 The project often captures mutants and experiments on them to enhance their superpowers, turning them into weapons. 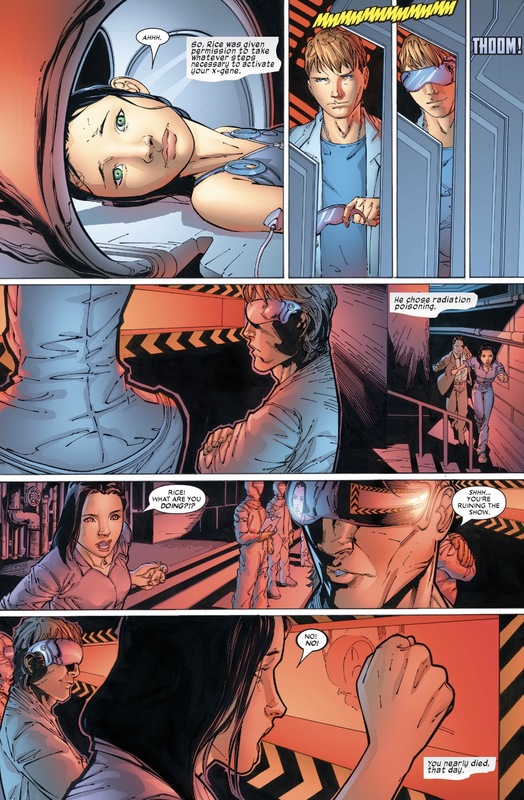 They also mutate baseline humans. 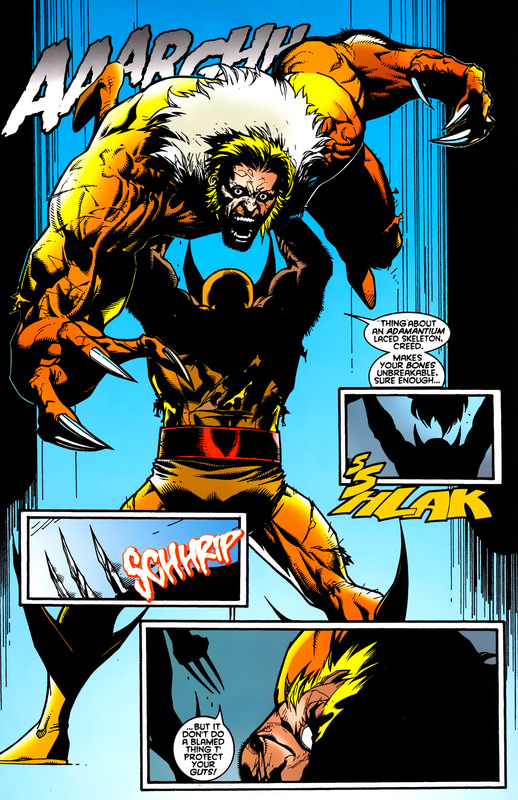 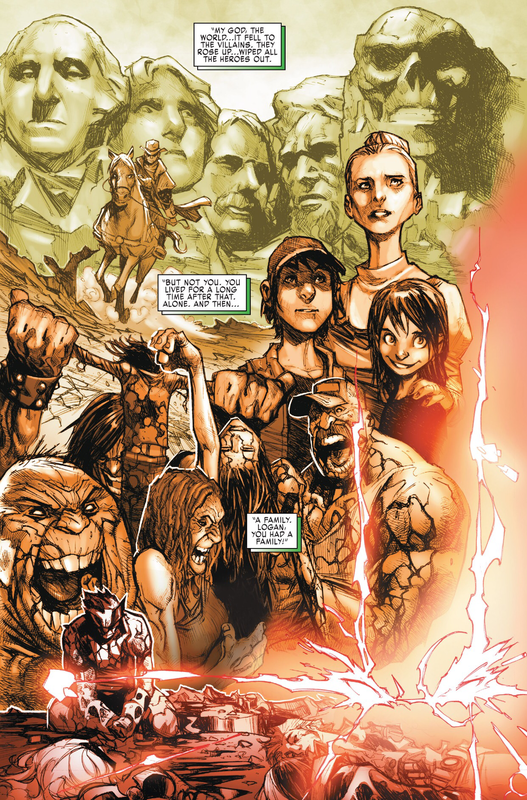 The Weapon X Project produced Wolverine, Leech, and other characters such as Deadpool and Sabretooth. 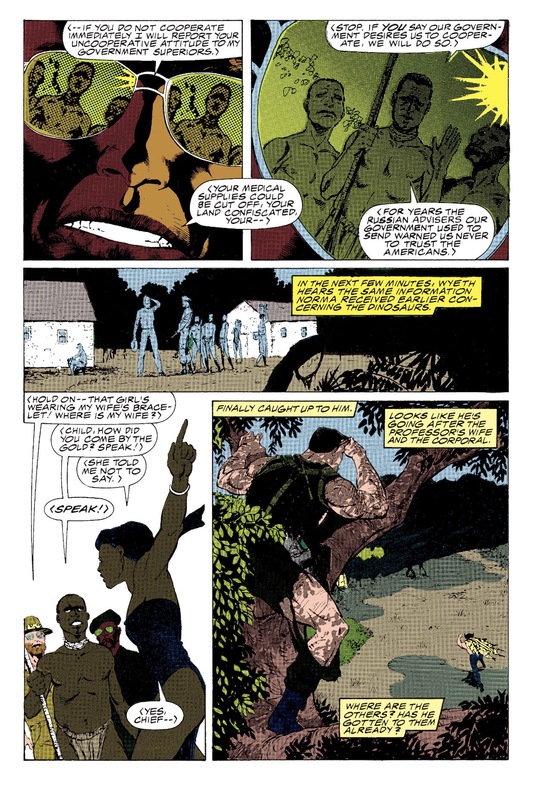 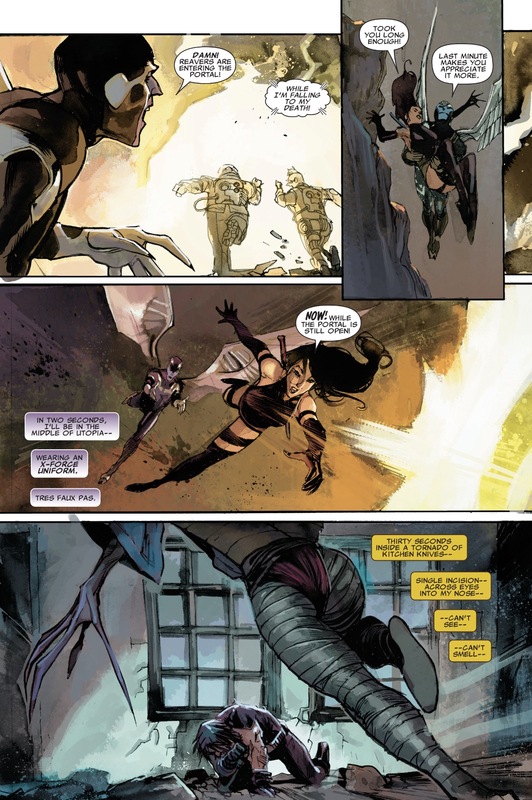 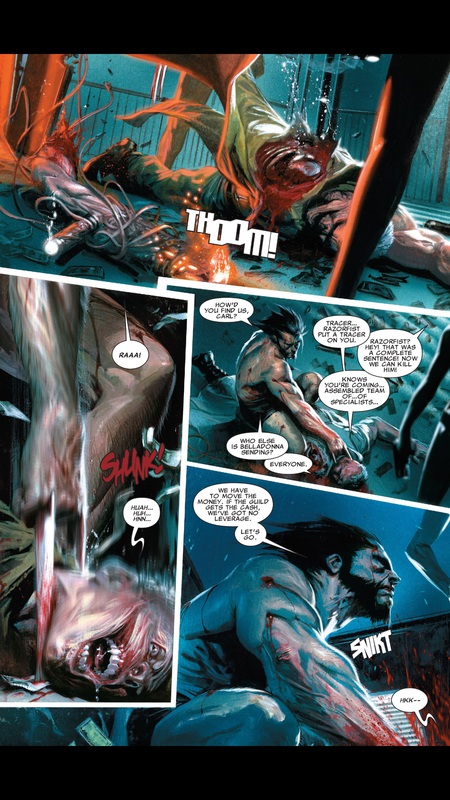 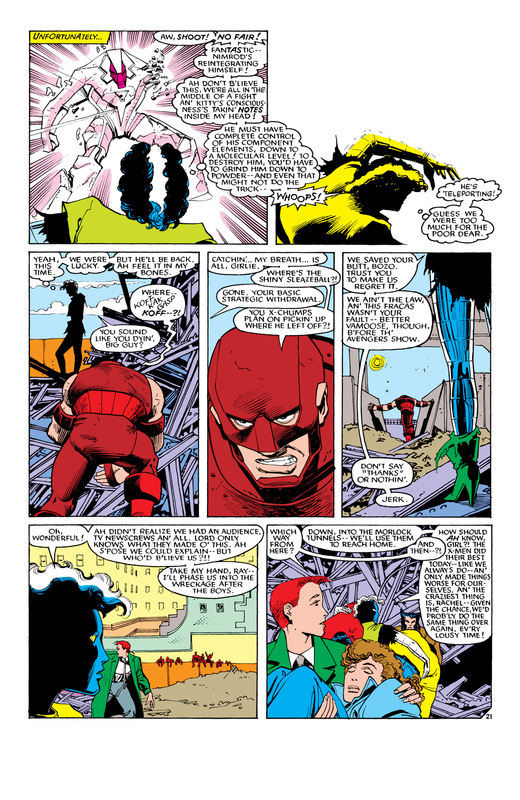 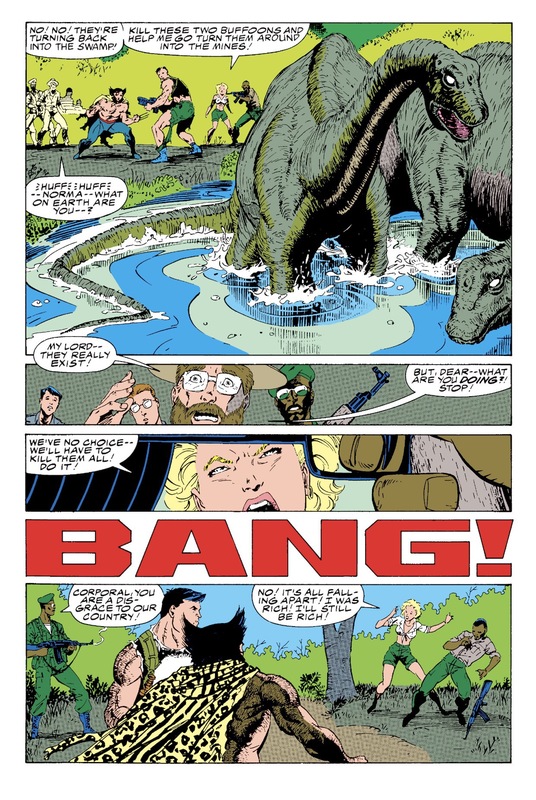 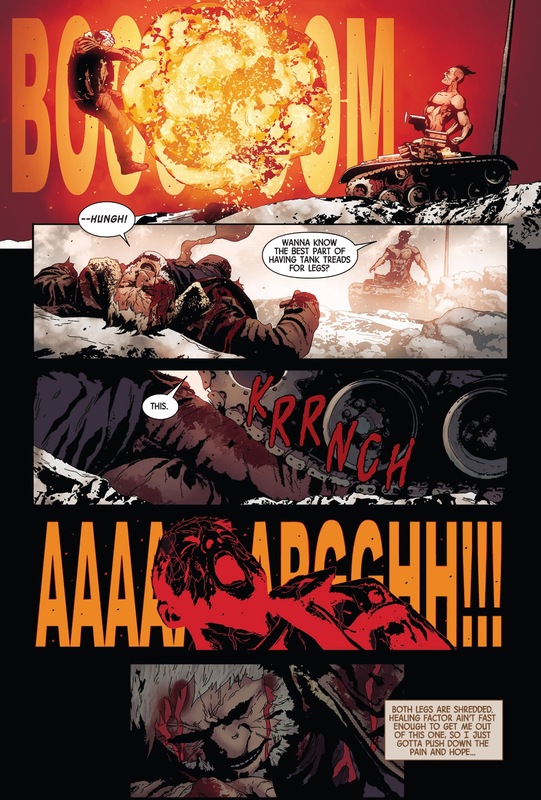 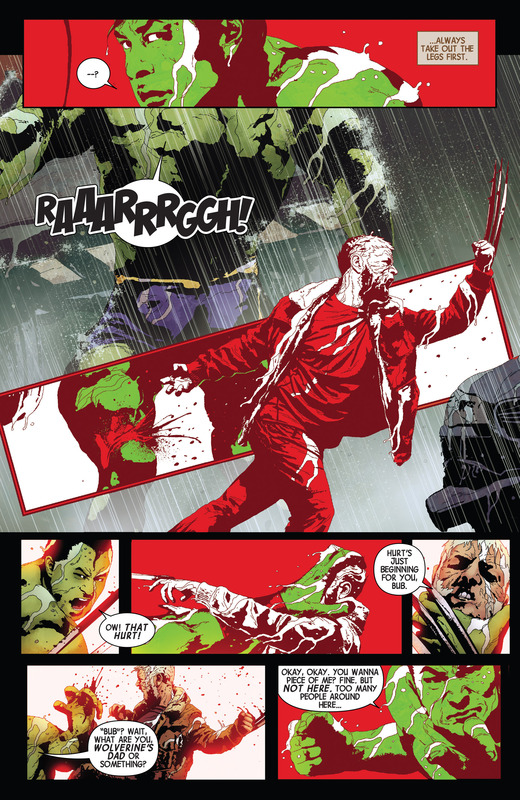 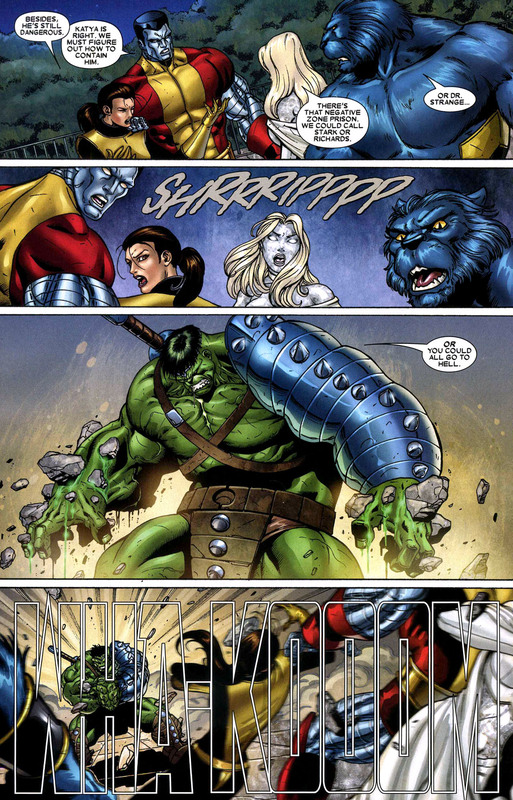 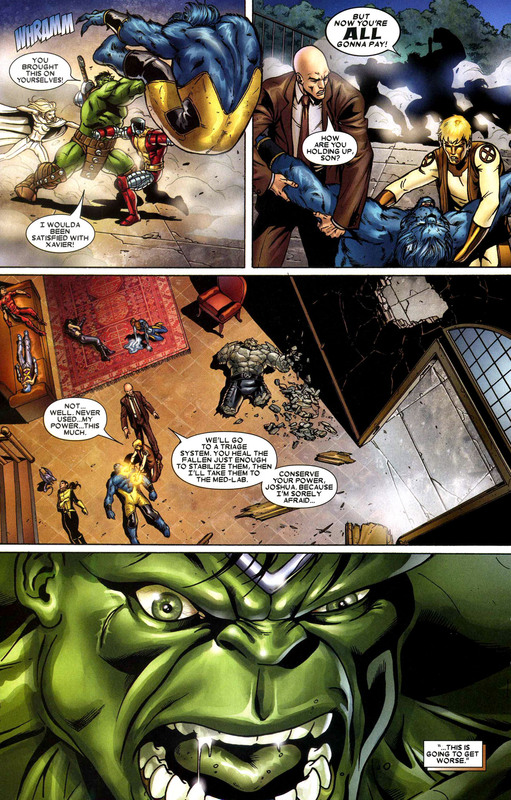 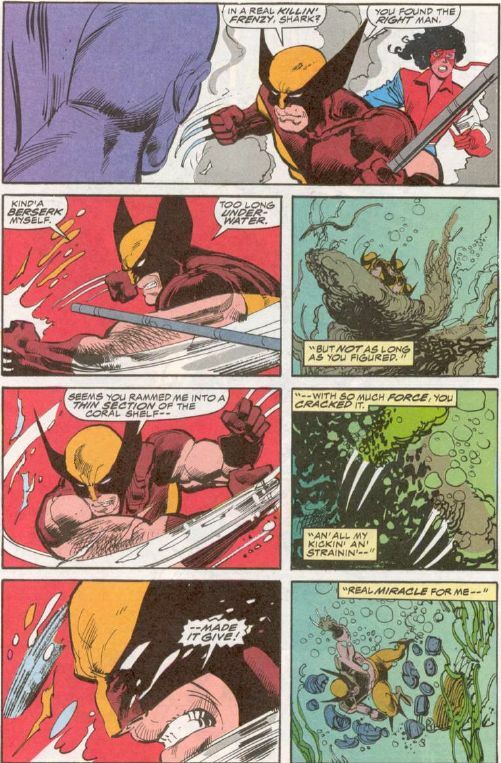 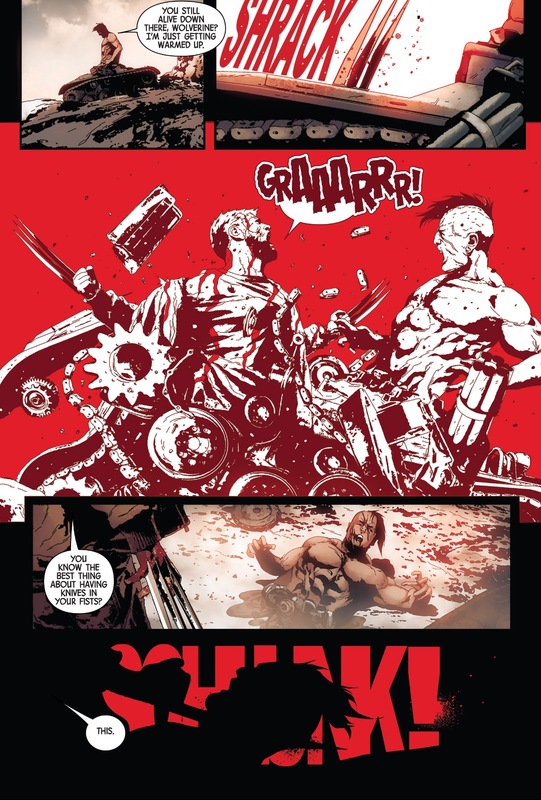 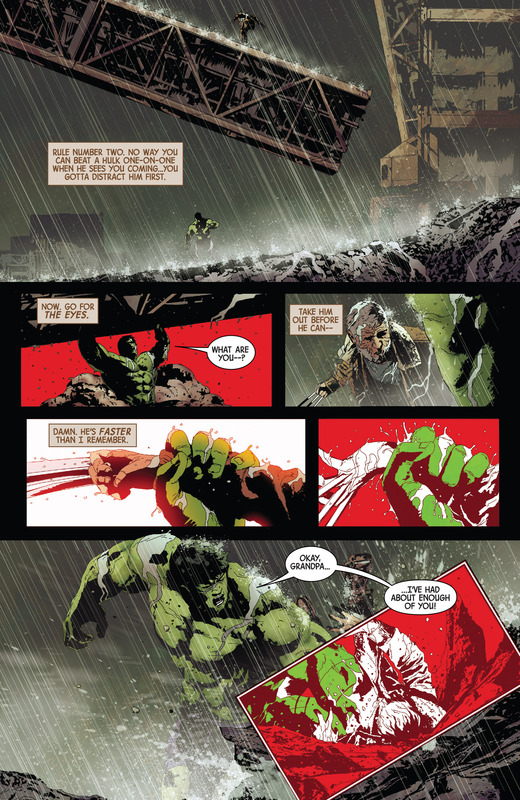 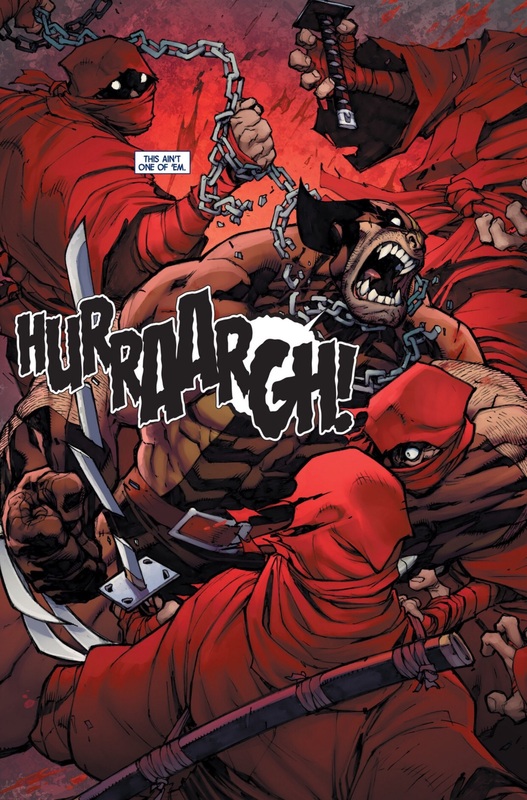 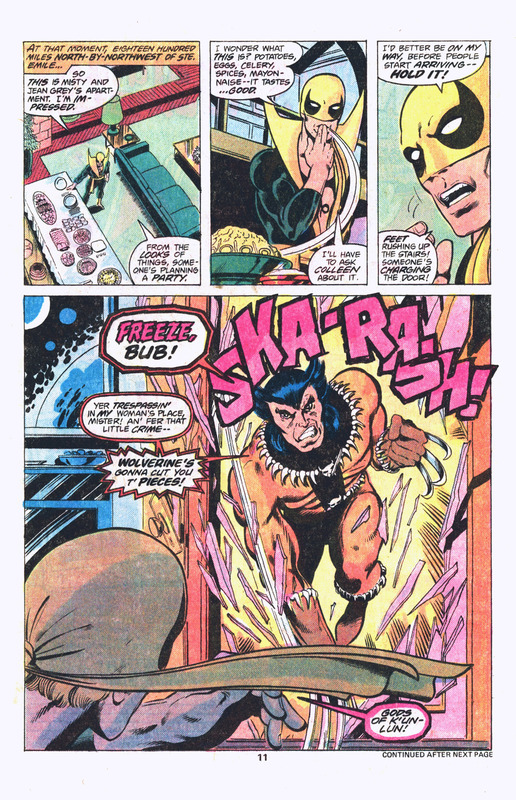 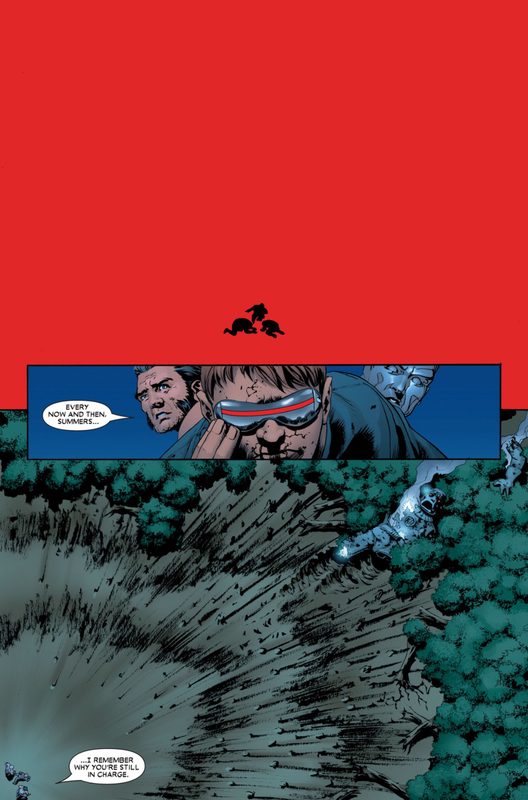 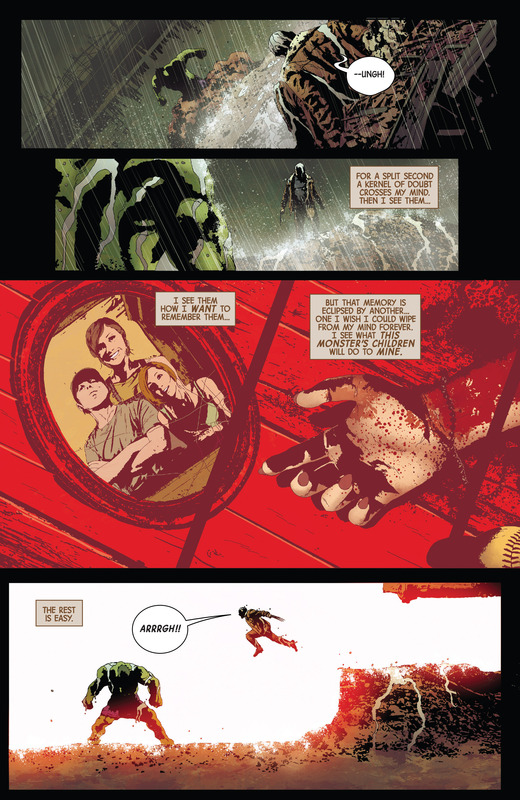 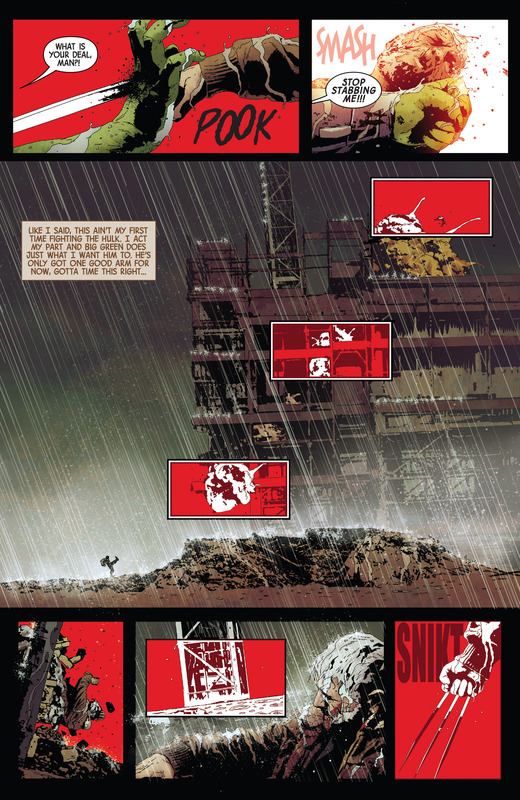 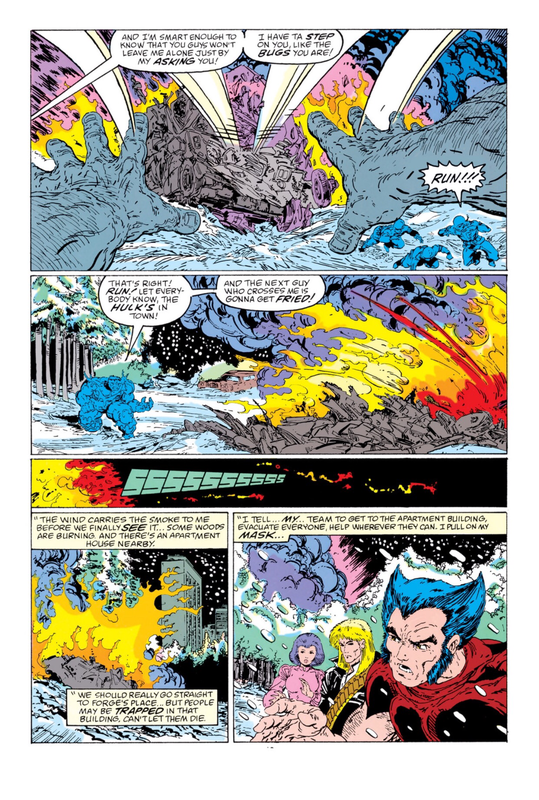 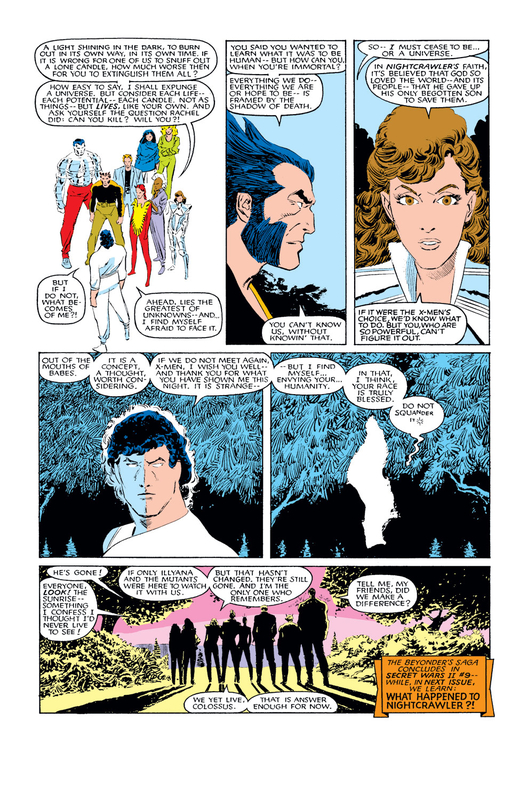 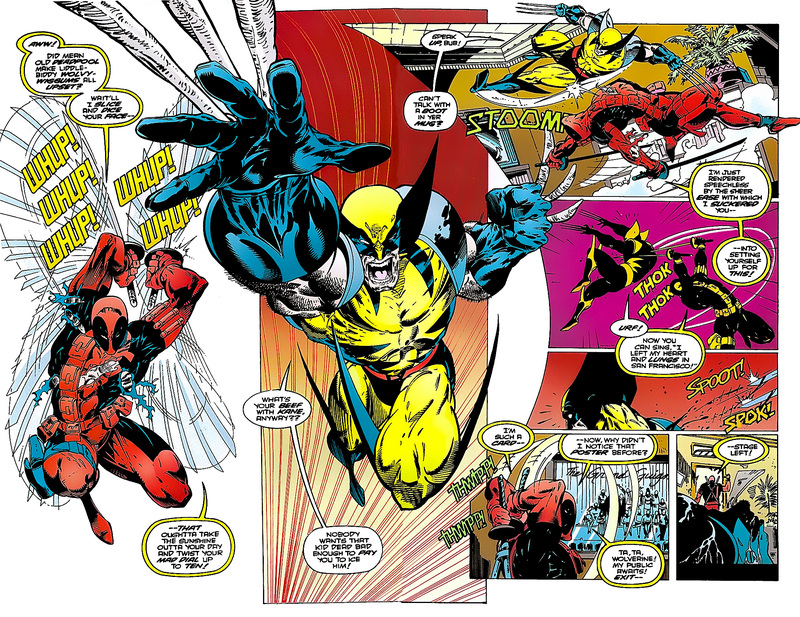 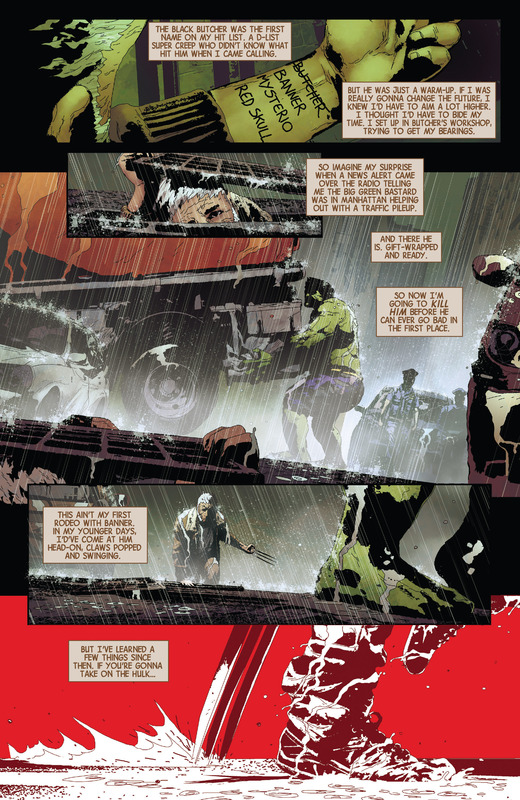 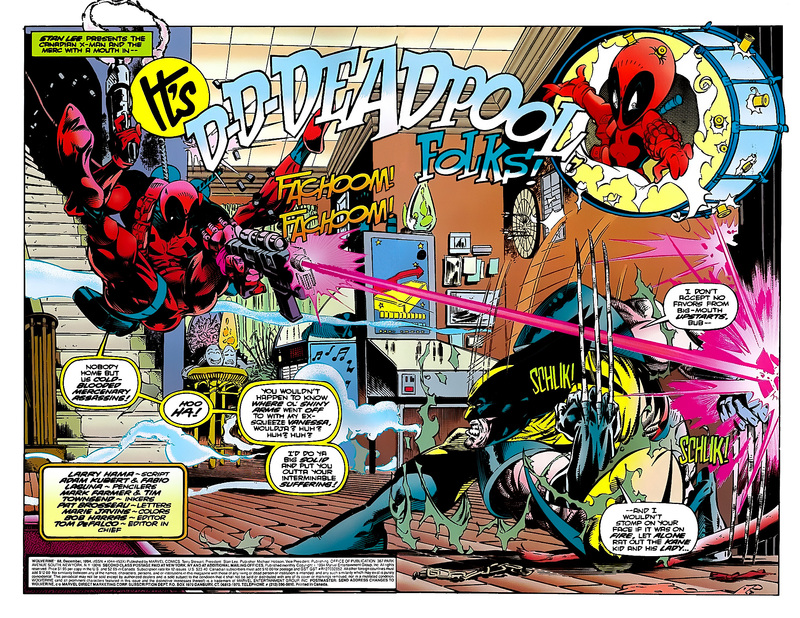 The story intertwines with some of Wolverine’s past, and eventually ends with Wolverine’s rampage being described in full, only to be revealed as the work of a Virtual reality system which actually predicted the events of Wolverine’s escape which then occur in real life moments later. 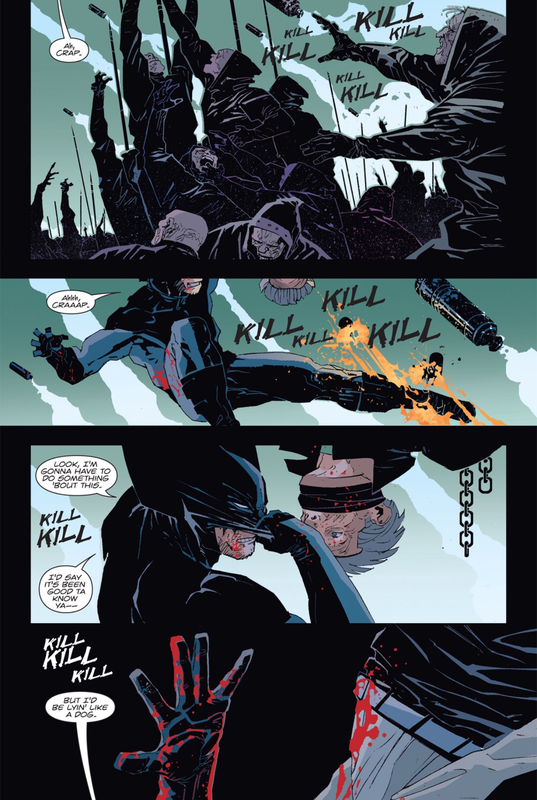 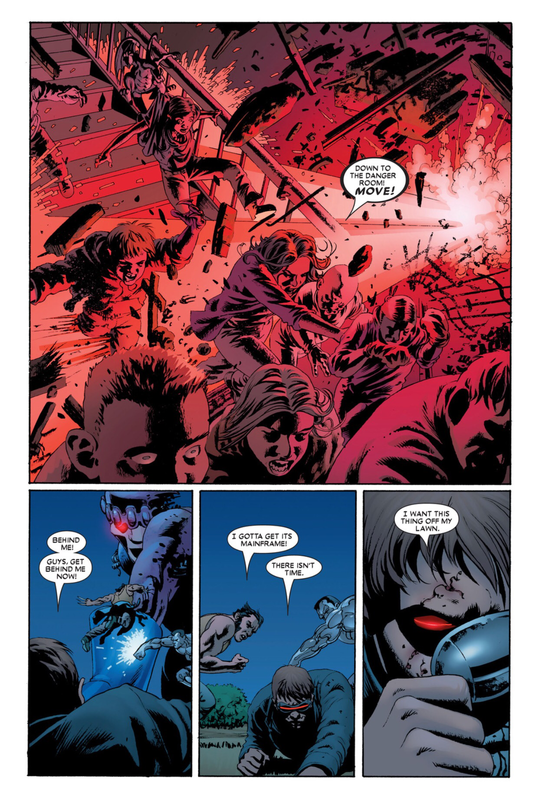 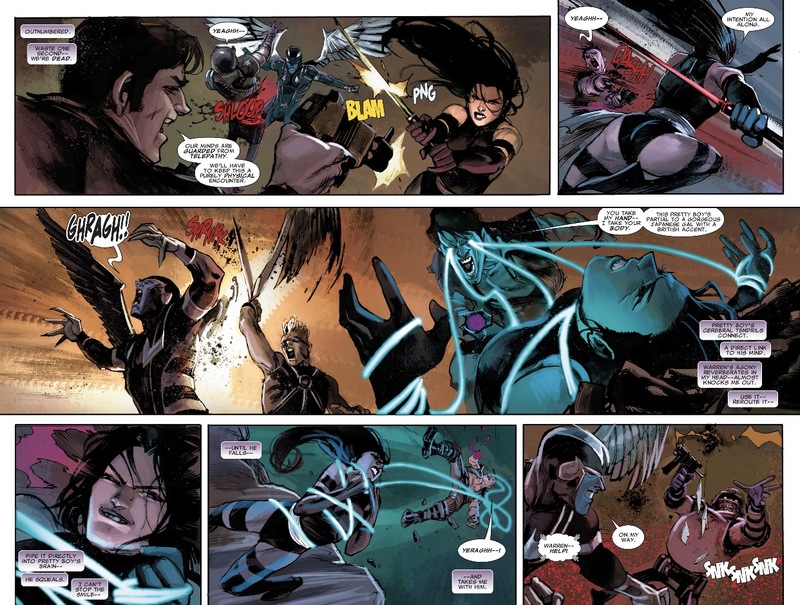 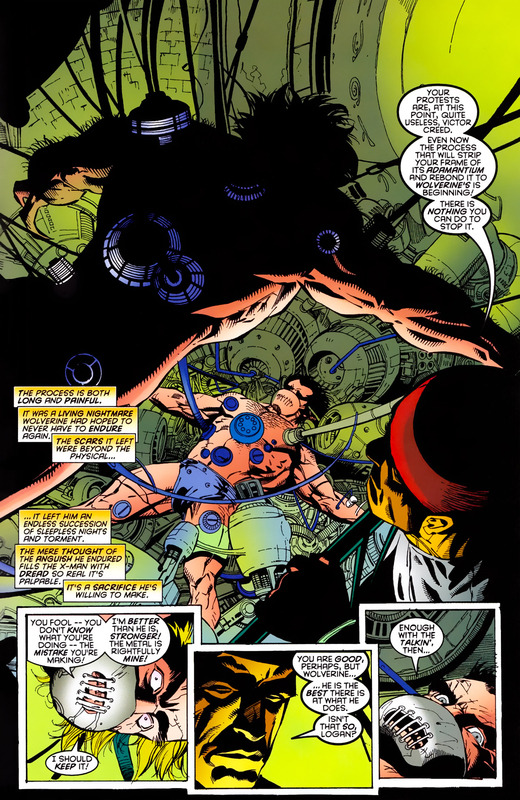 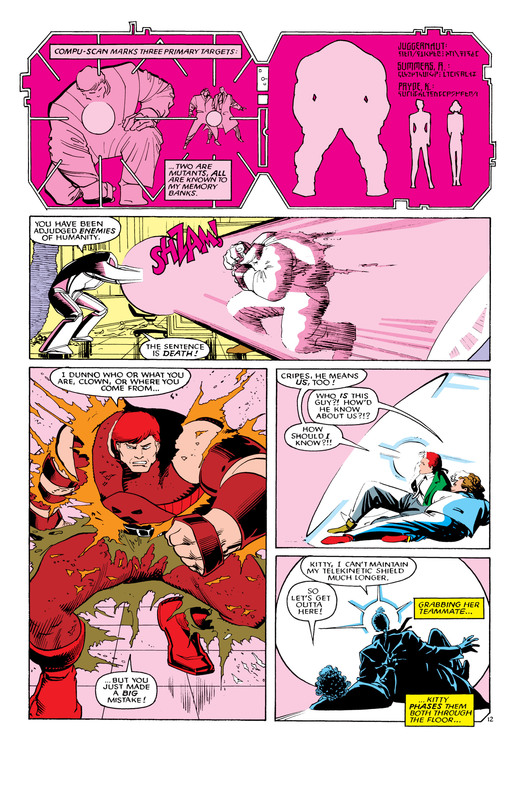 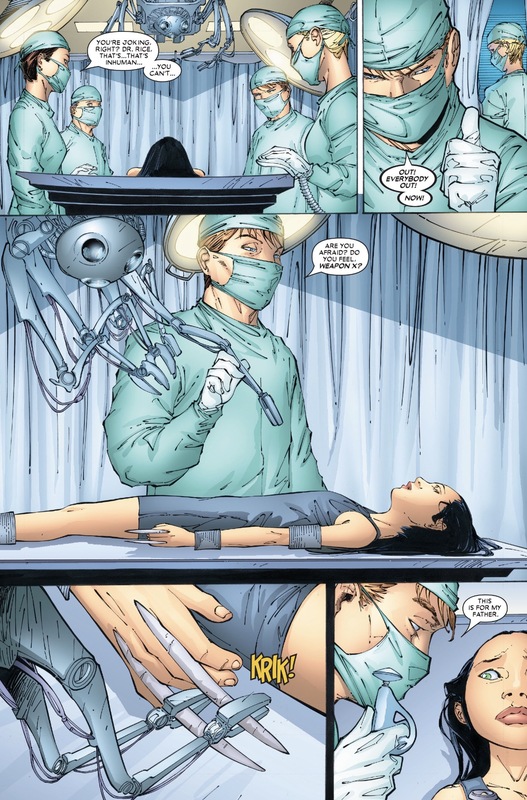 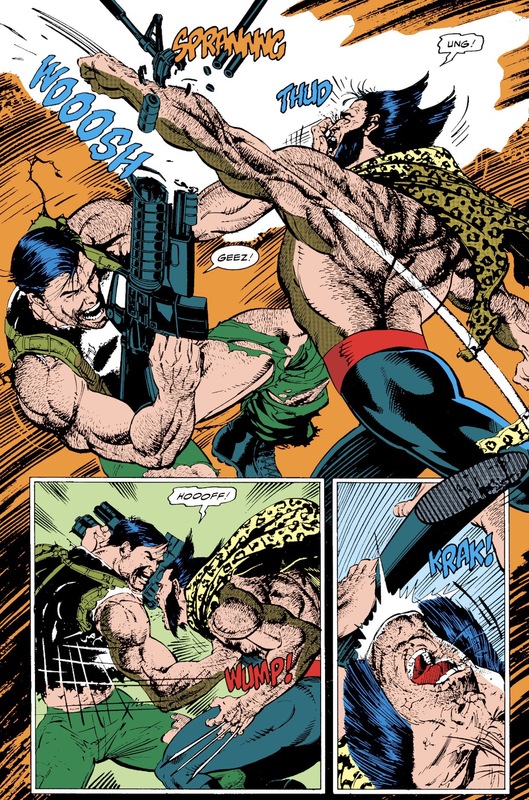 In this classic story, Experiment X, or the brutal adamantium-skeletal bonding process, (originally published in Marvel Comics Presents #72-84 in 1991) was eventually revealed as part of the “Weapon X Project.” Grant Morrison’s New X-Men in 2002 further revealed that Weapon X was the tenth of a series of such projects, collectively known as the Weapon Plus Program, and the X in “Weapon X” referred not (or not exclusively) to the letter X, but to the Roman numeral for the number 10. 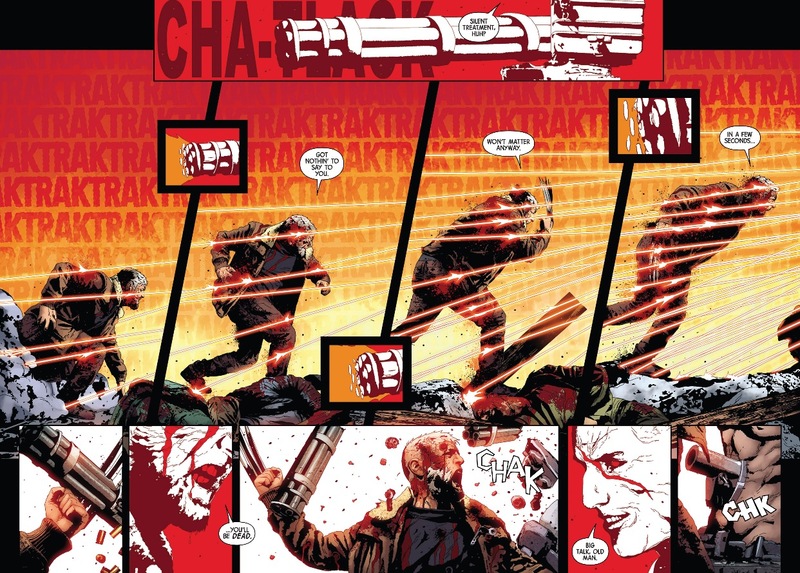 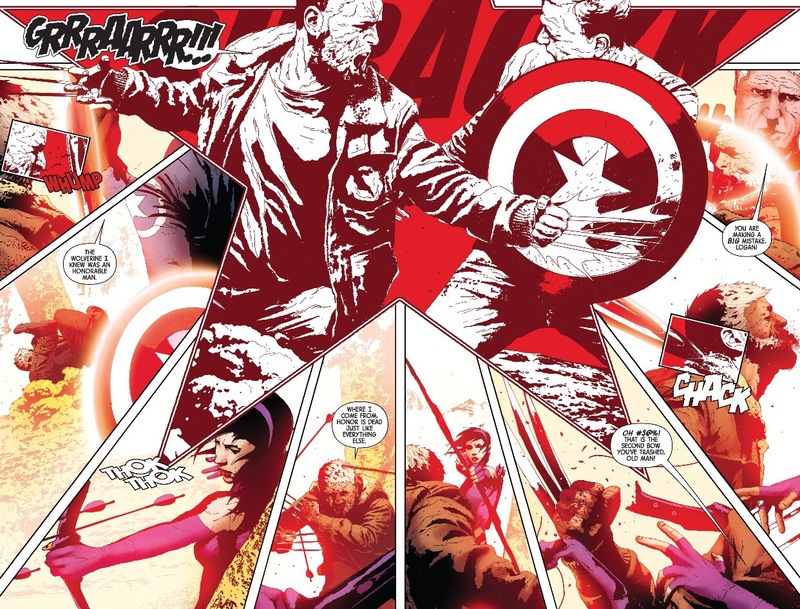 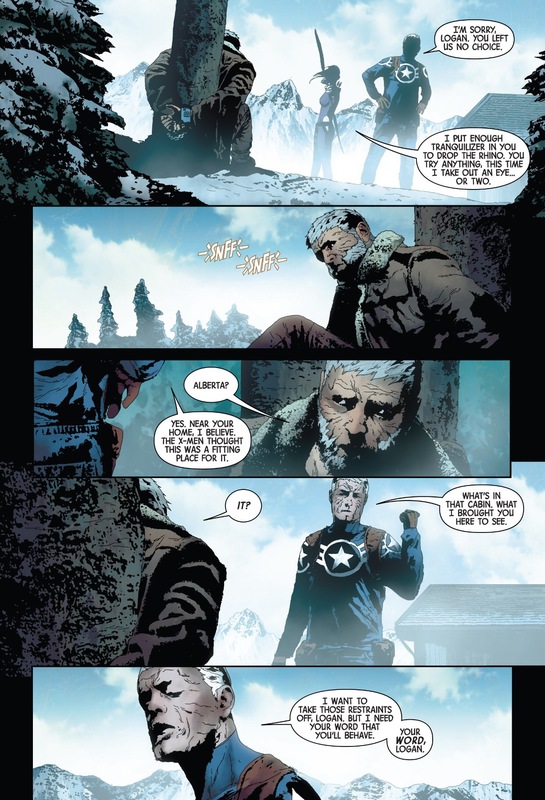 The first project, Weapon I, pertained to the Super Soldier Project that created Captain America. 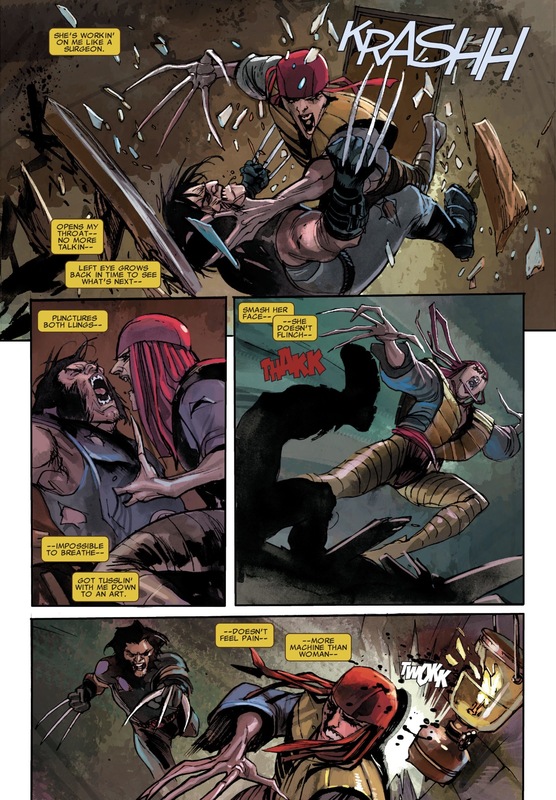 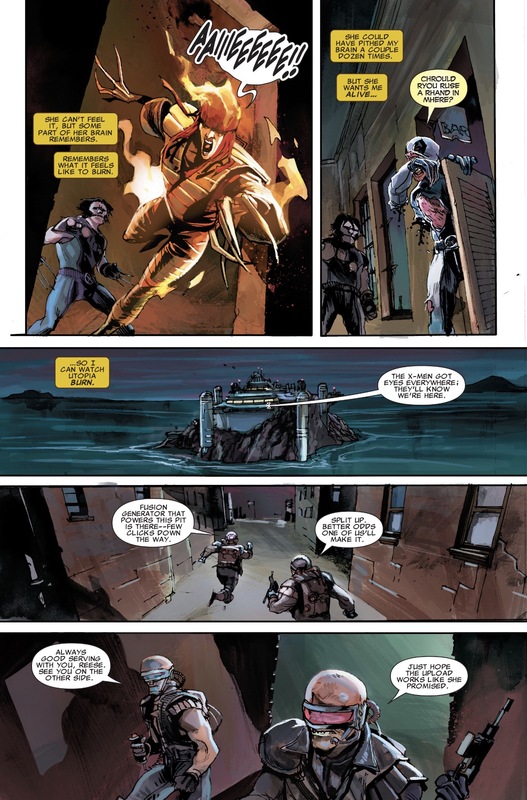 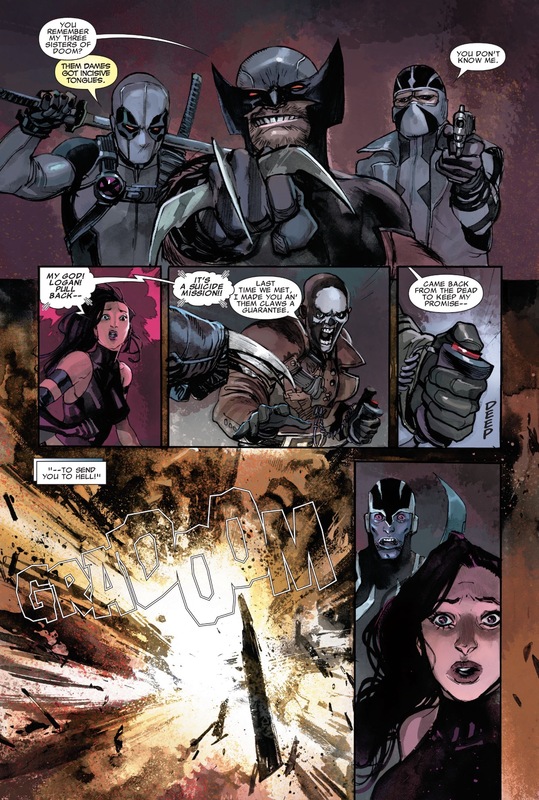 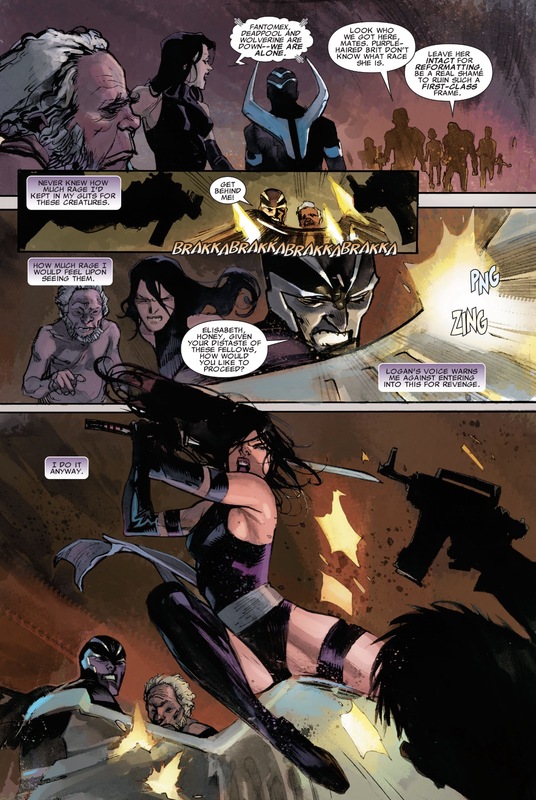 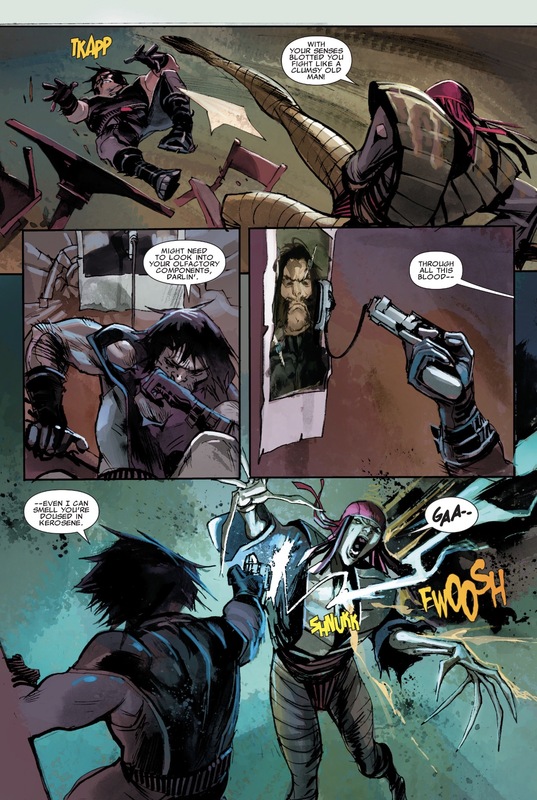 This entry was posted in Marvel Comics, weapon x, Wolverine and tagged Marvel Comics, weapon x, wolverine on August 25, 2015 by lowbrowcomics. 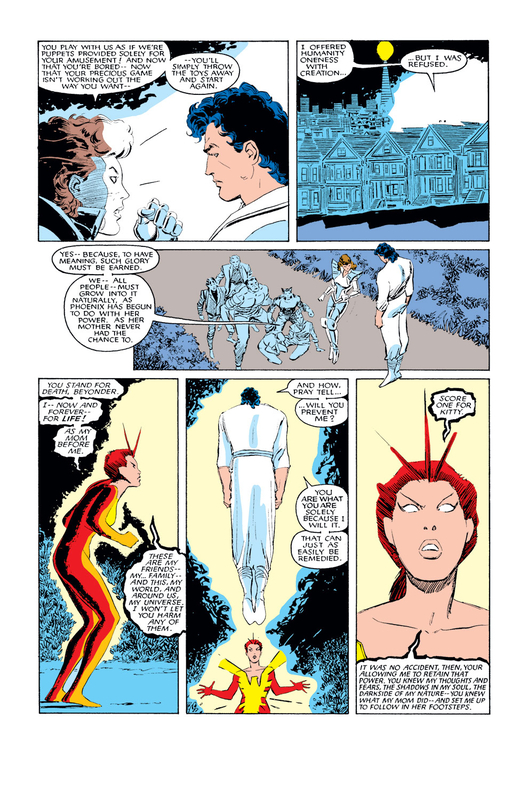 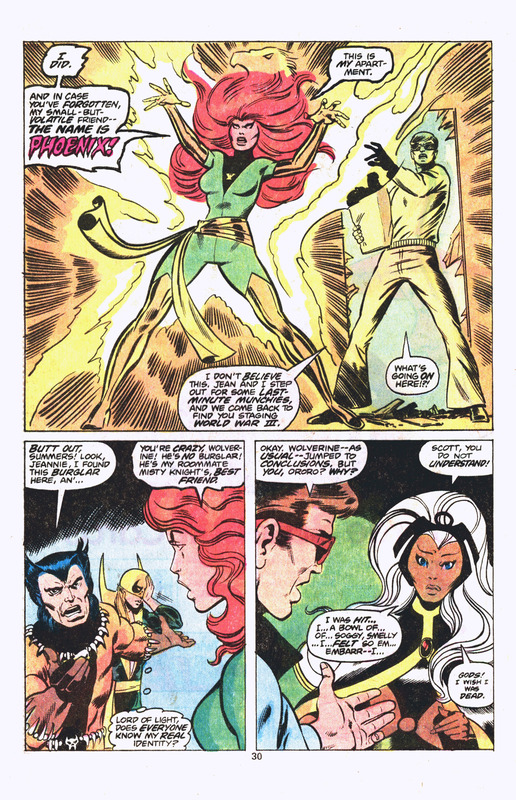 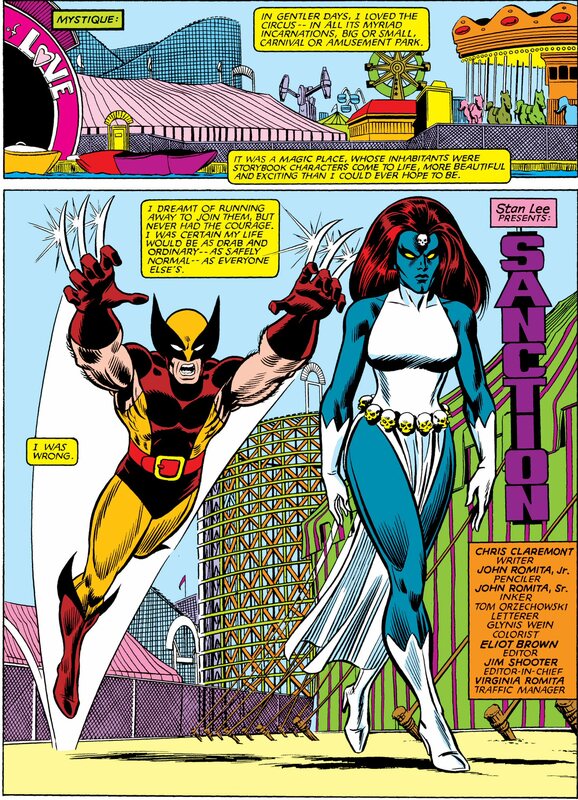 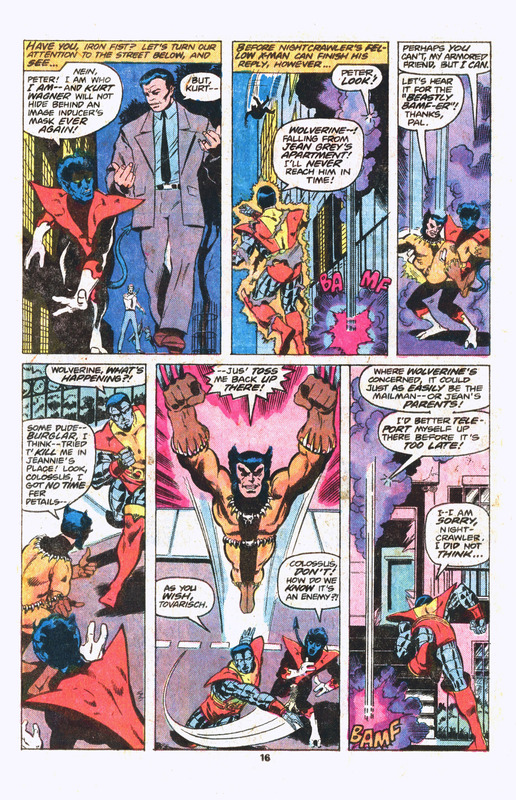 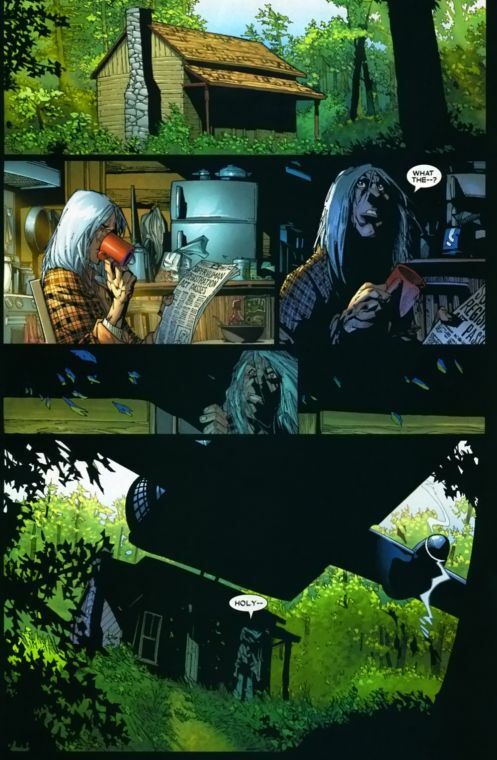 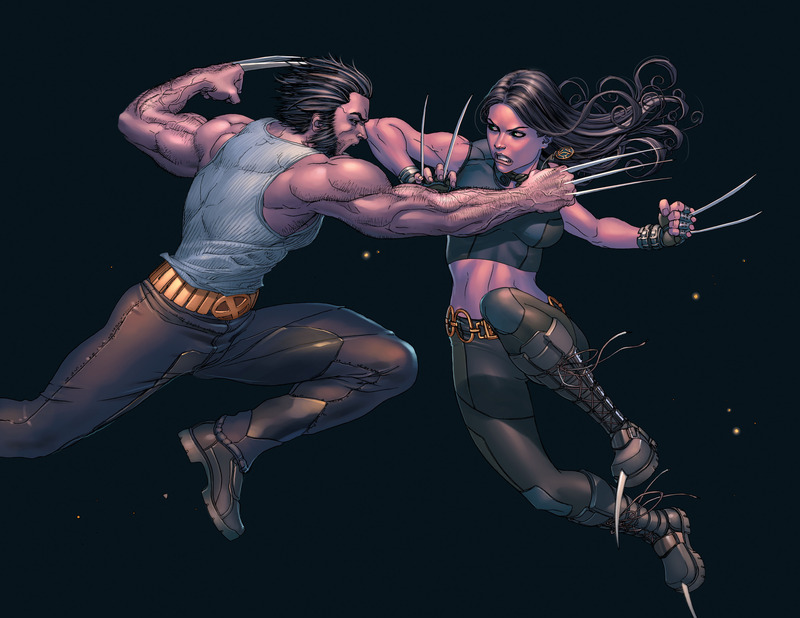 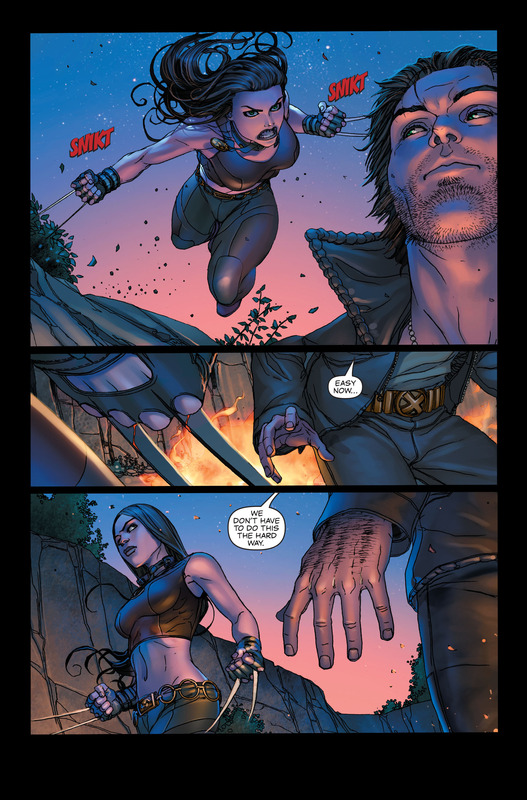 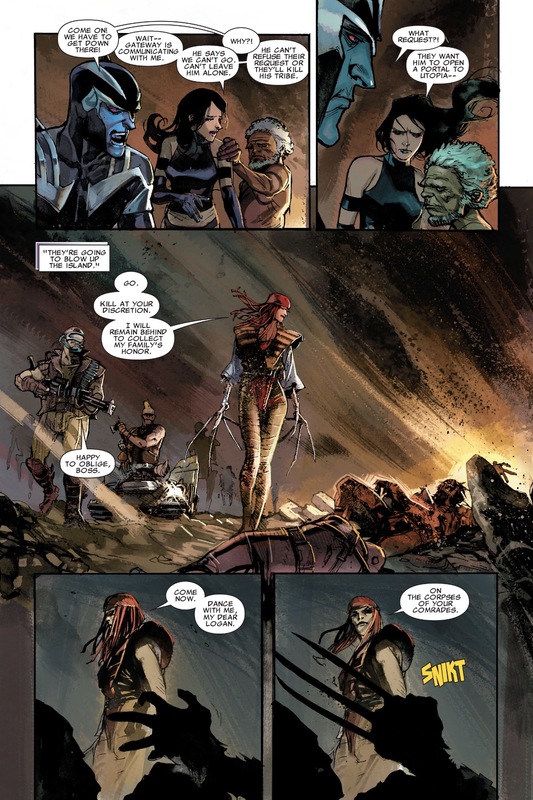 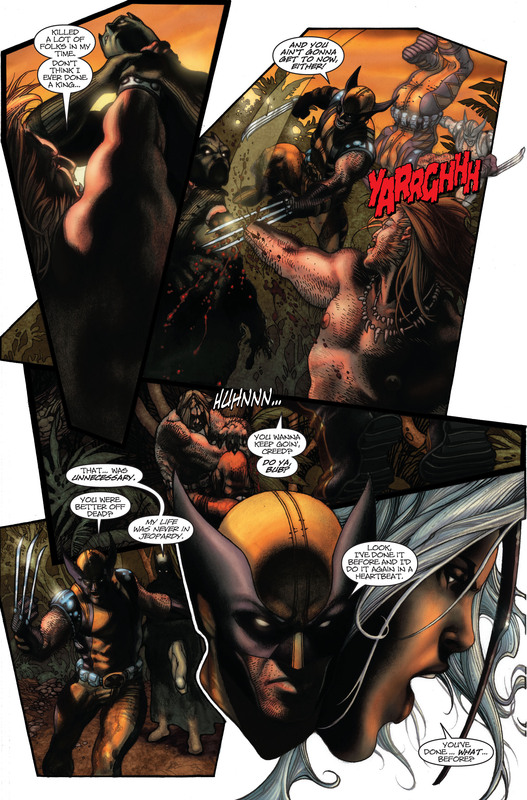 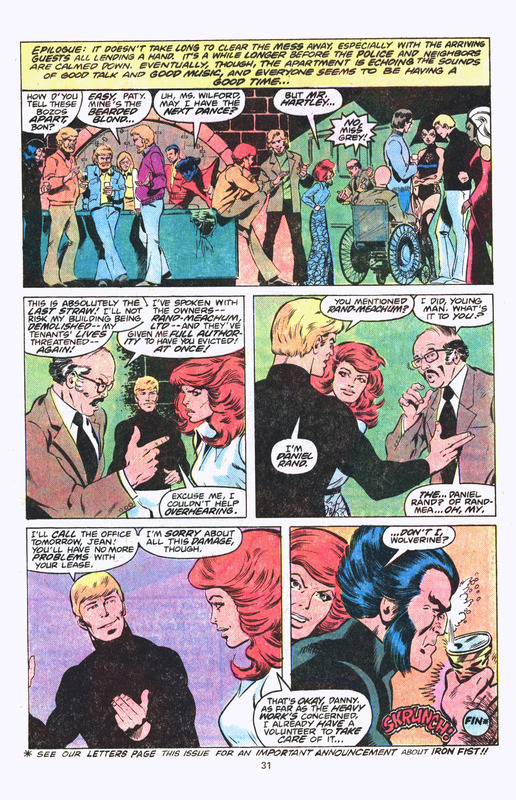 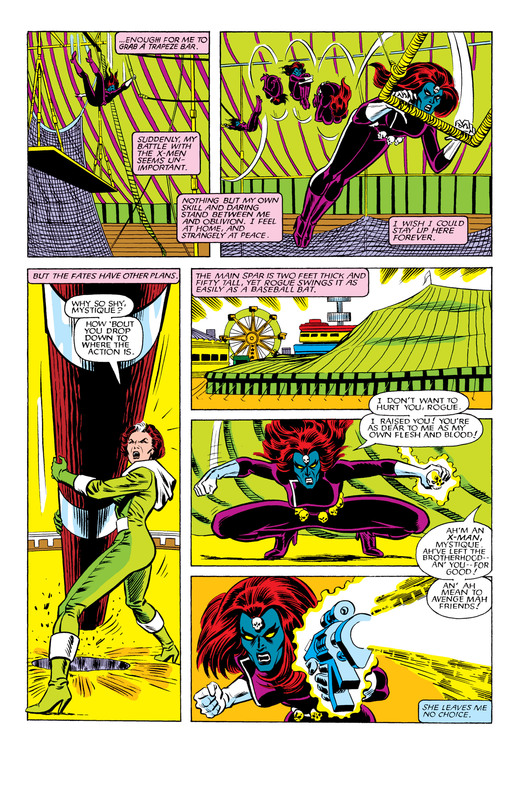 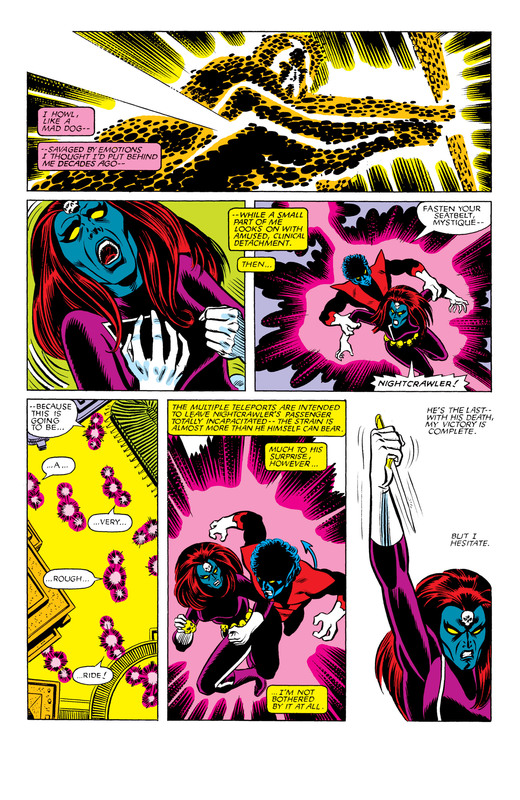 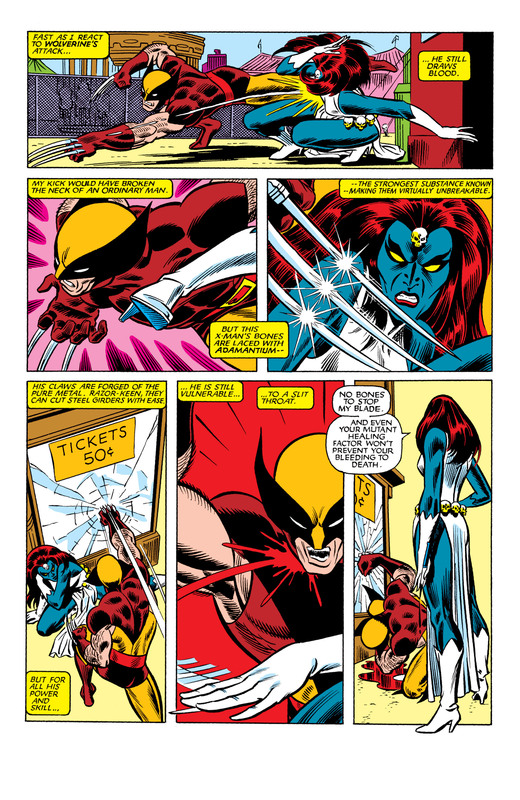 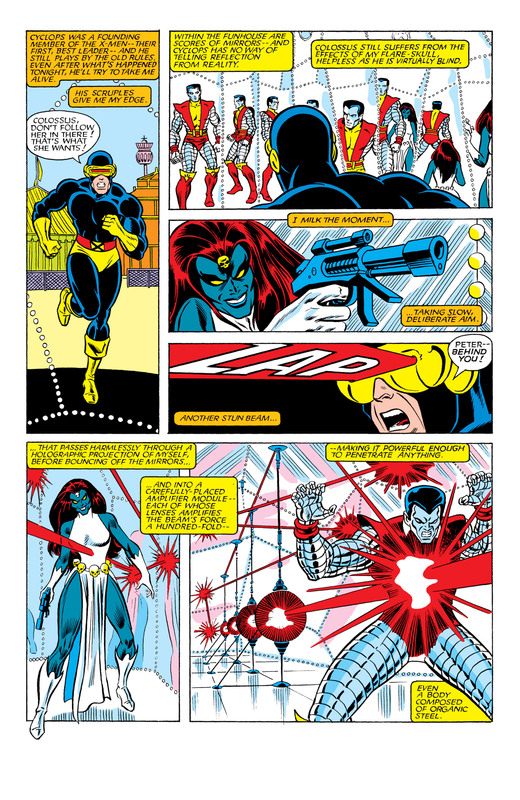 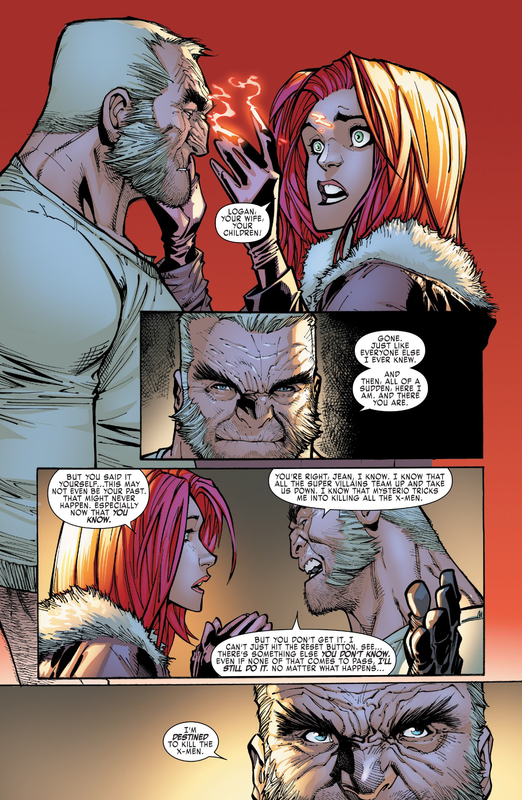 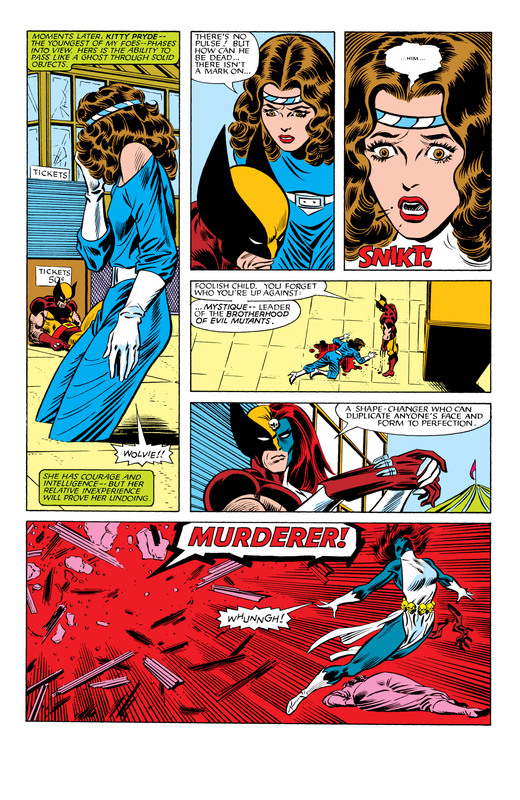 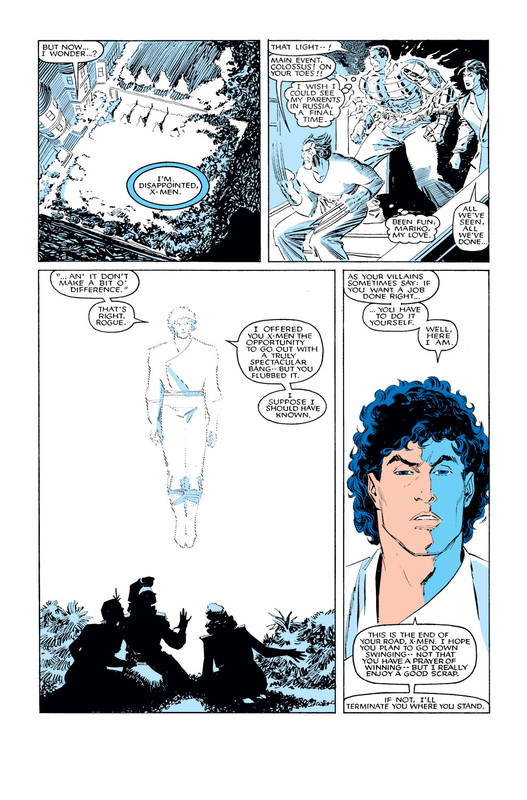 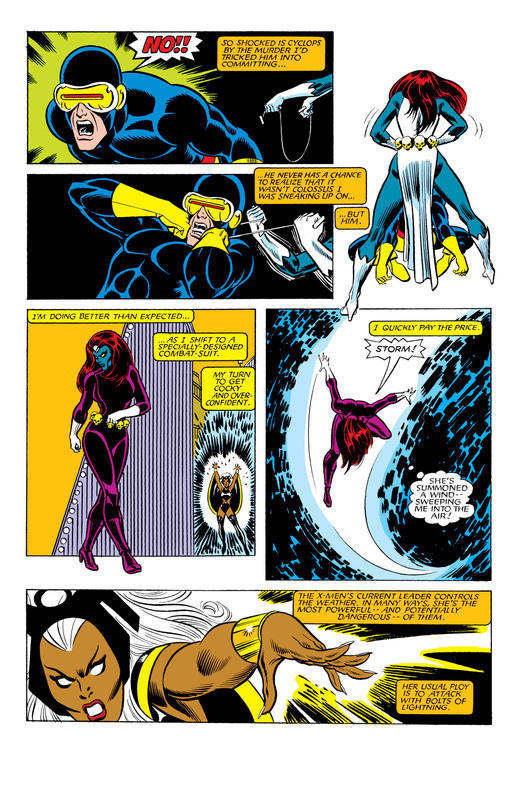 This entry was posted in Wolverine and tagged Mystique on July 25, 2015 by lowbrowcomics. 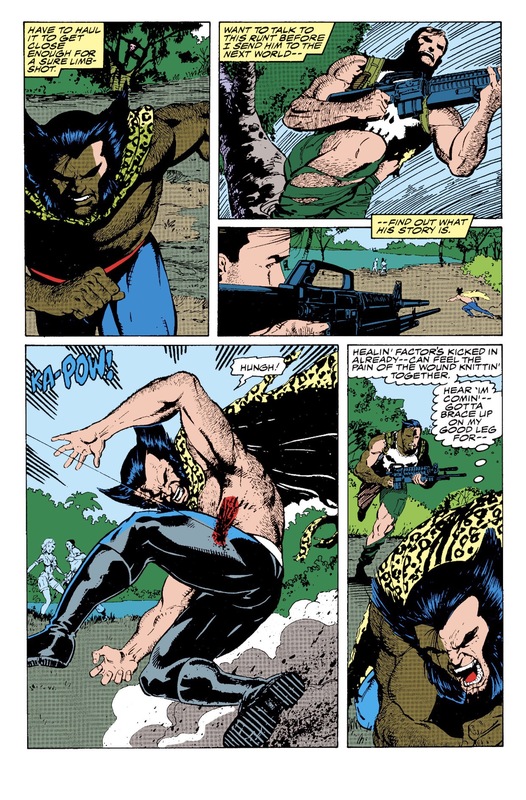 Wolverine is hunting Nitro. 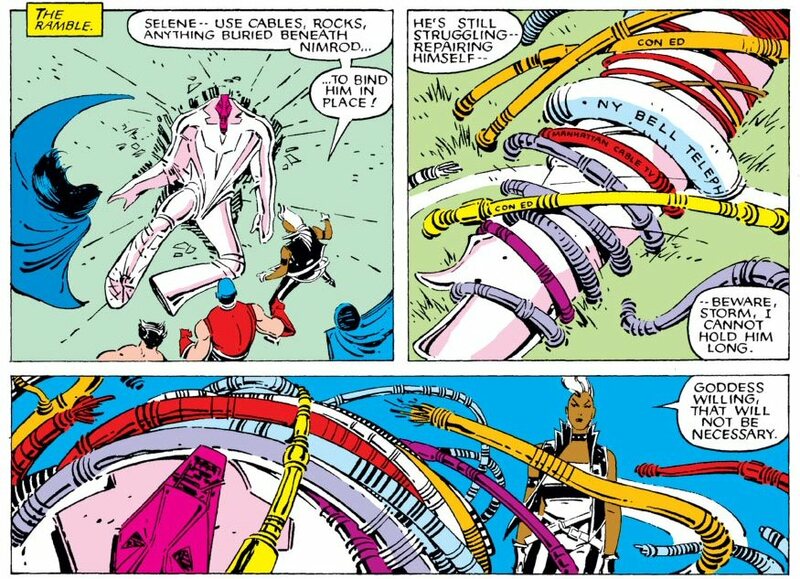 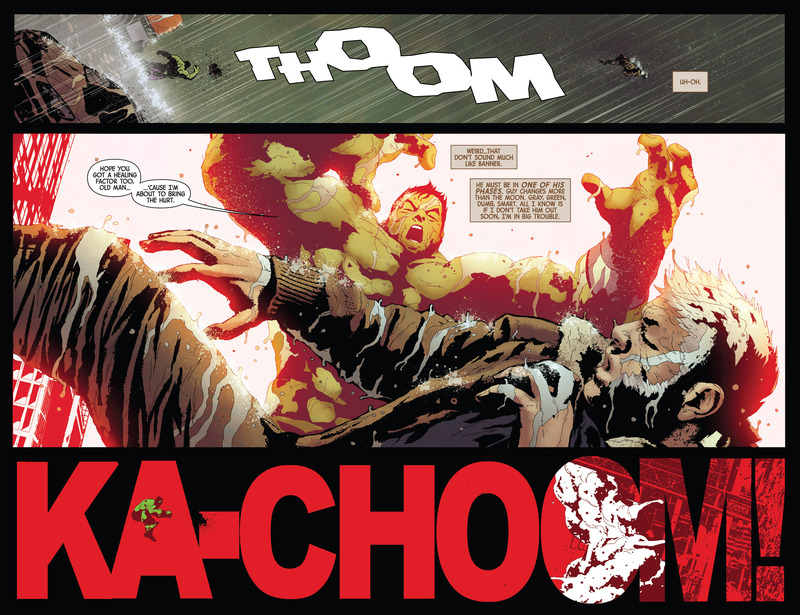 Nitro is responsible for blowing up a school and inadvertently kicking off the Marvel Comics Civil War. 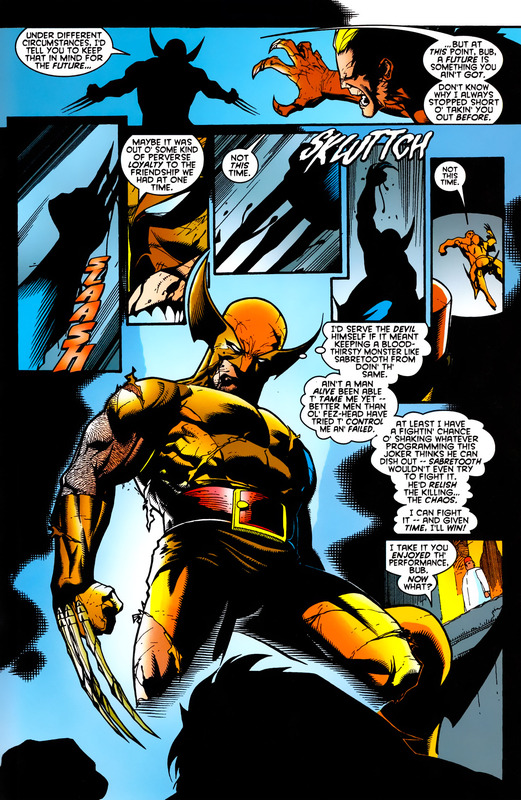 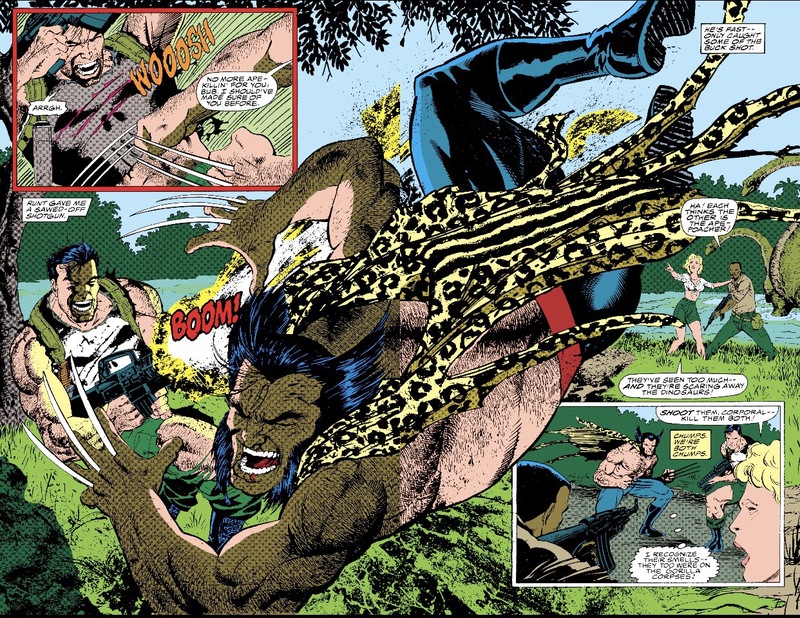 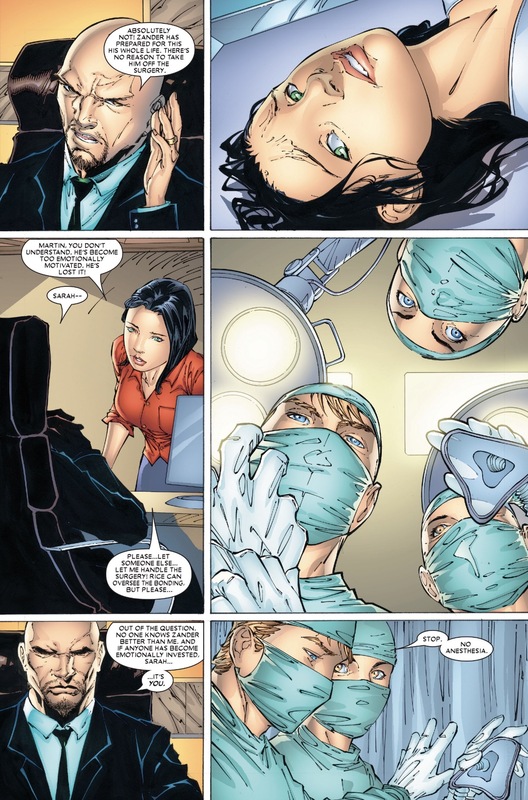 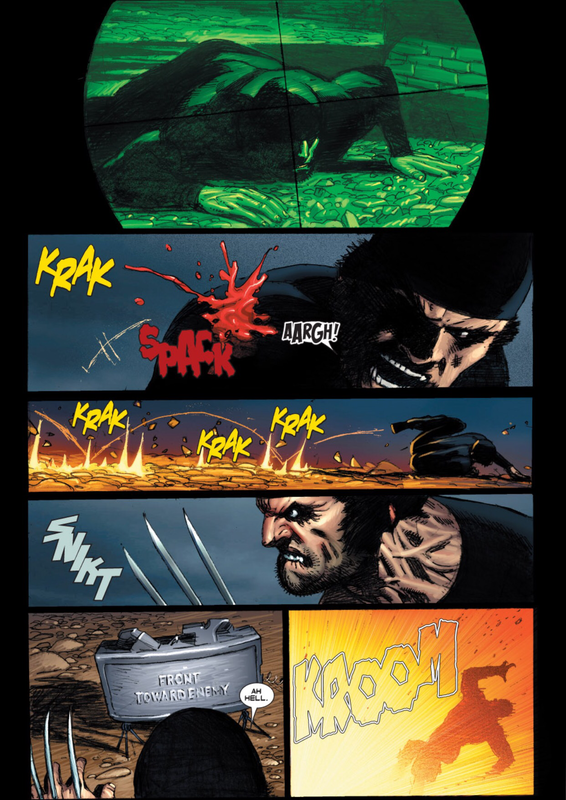 In the process of hunting down Nitro, Wolverine’s healing factor is pushed to the limit. 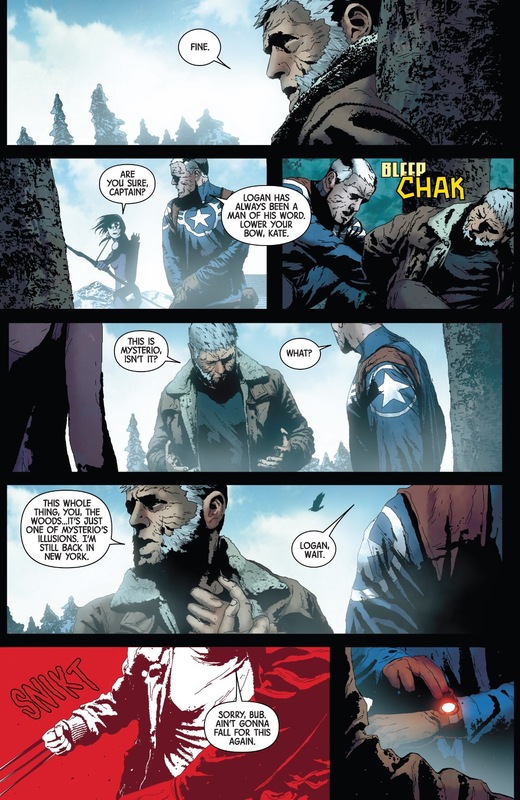 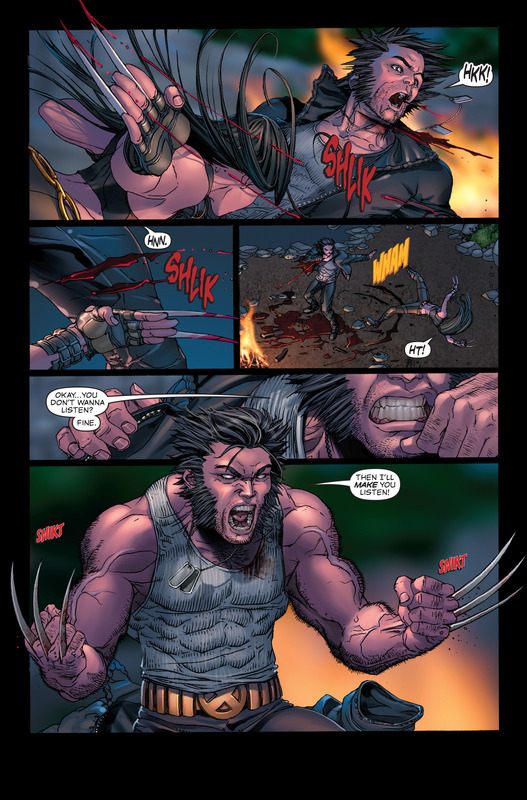 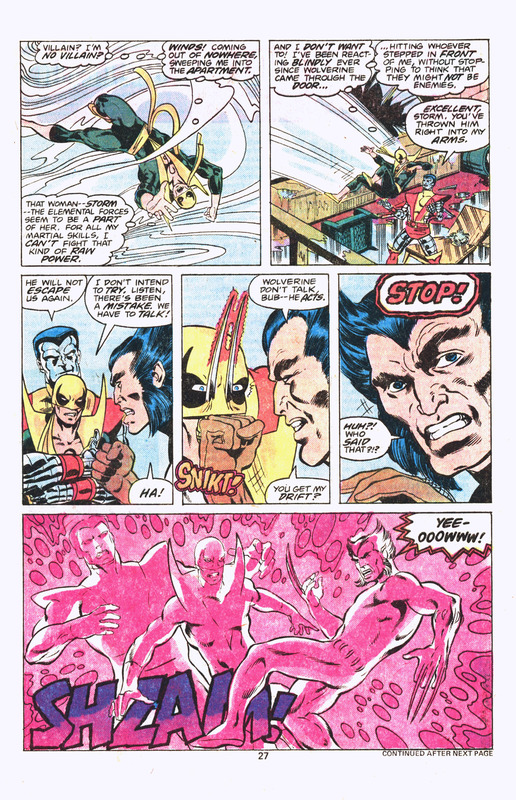 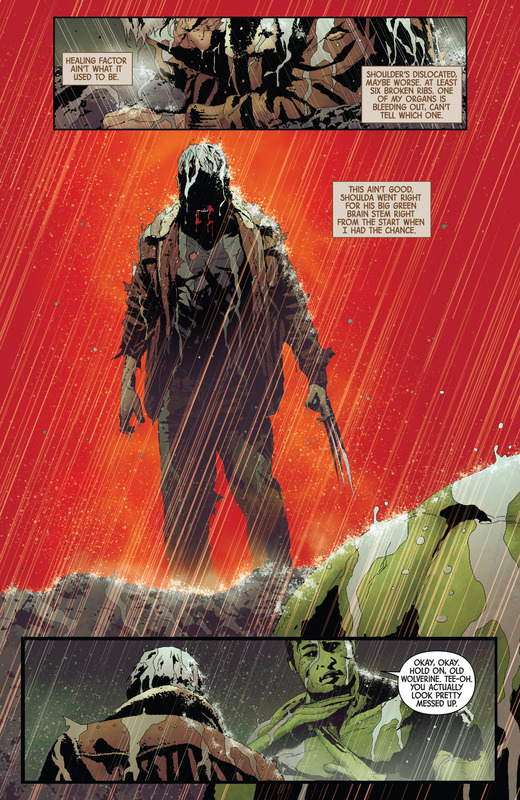 This entry was posted in Wolverine on April 8, 2015 by lowbrowcomics.